I have no relation to this web-host banner advertising on this free website! Soon here you can see more pictures related with the 1908 Tunguska event (if this link does not work, then you could visit an old and brief version of my article at www.olkhov.narod.ru/tunguska.htm ), and on other related topics. 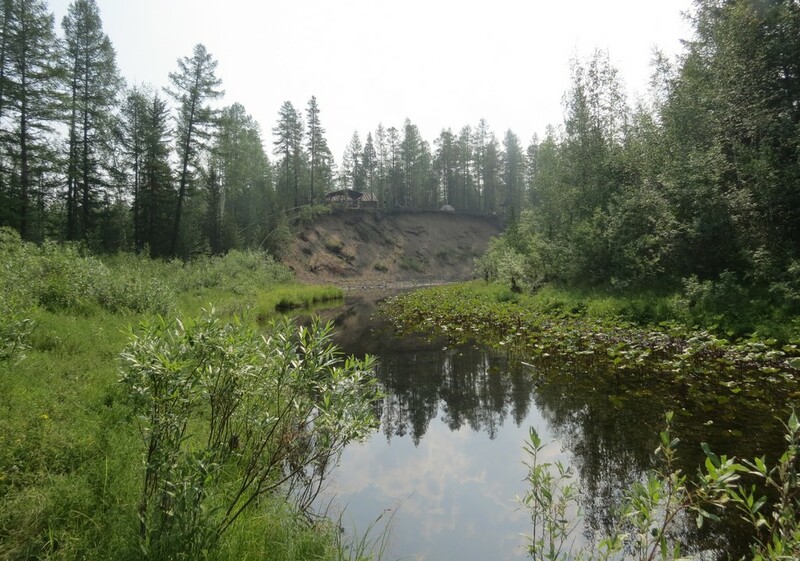 But at first, I would like to show you a picture of the Tunguska meteorite! Yes, I am not joking: it is the only known drawing by eyewitness of so-called 'Tunguska meteorite' in flight! It was by T.N. 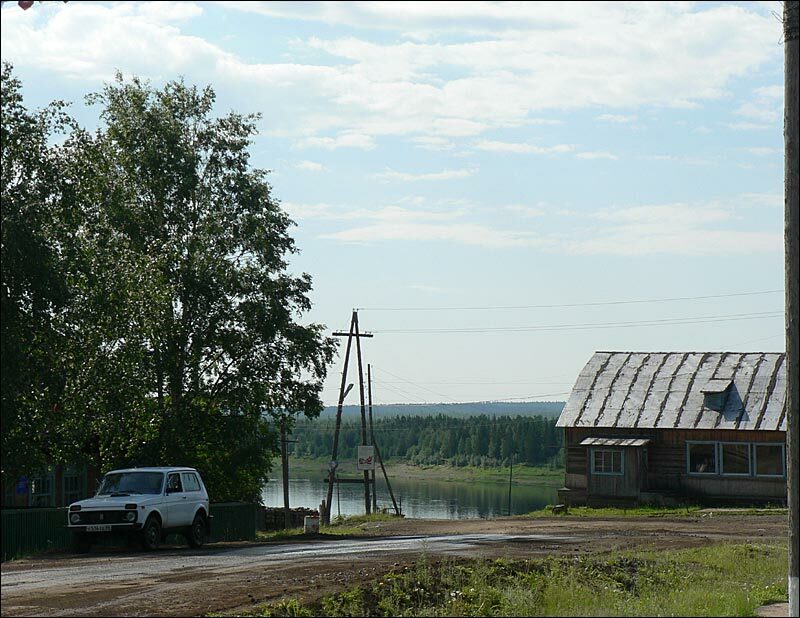 Naumenko from Kezshma (about 214 km to the SSE from the Tunguska epicenter), who described the 'meteorite' as a luminous moon-sized cloud. His account is often quoted as one of the main arguments for 'Tunguska meteorite', but his sketch is practically unknown. I have discovered it in the 1941 year issue of METEORITIKA, and reproduced in my publications, including my book on Tunguska. If you look at the picture, you will understand why it was quickly 'forgotten' by supporters of the 'Tunguska meteorite'. 2. 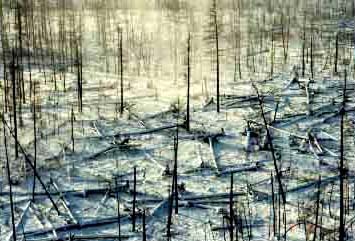 Tunguska 'crater' (photo by V. Romeiko). 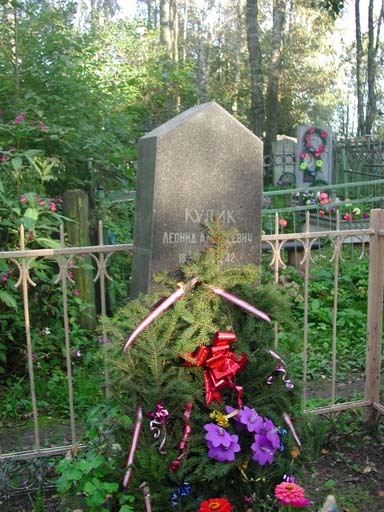 When Kulik saw the depression, later named after his helper Suslov, he became sure that the meteorite fragment fell here. 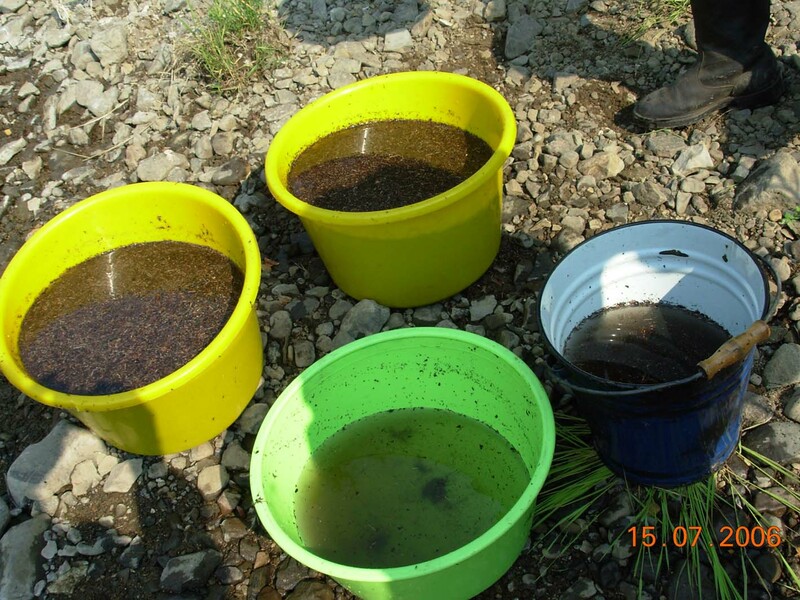 But no any meteorite fragment were discovered in this and other similar smaller depressions. Today it is generally accepted that the depressions are thermokarsts, i.e. 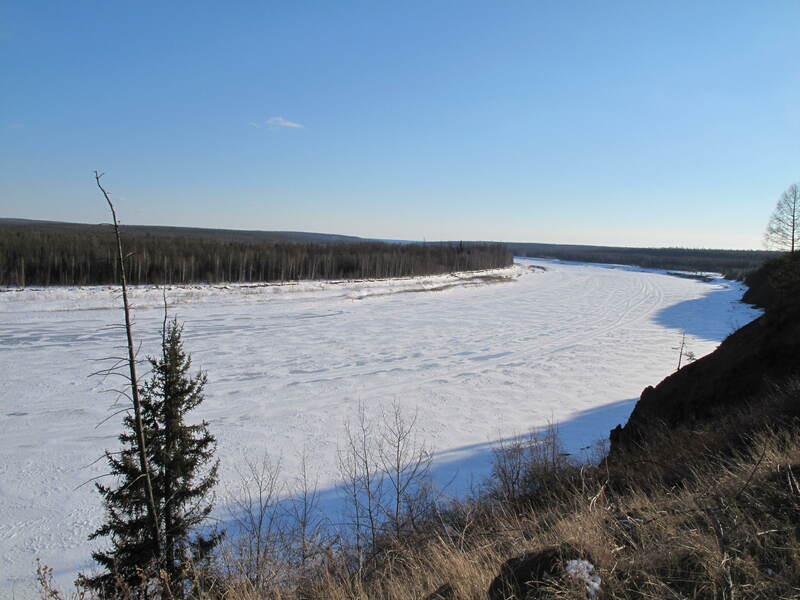 due to permafrost melt (you can read details here) . 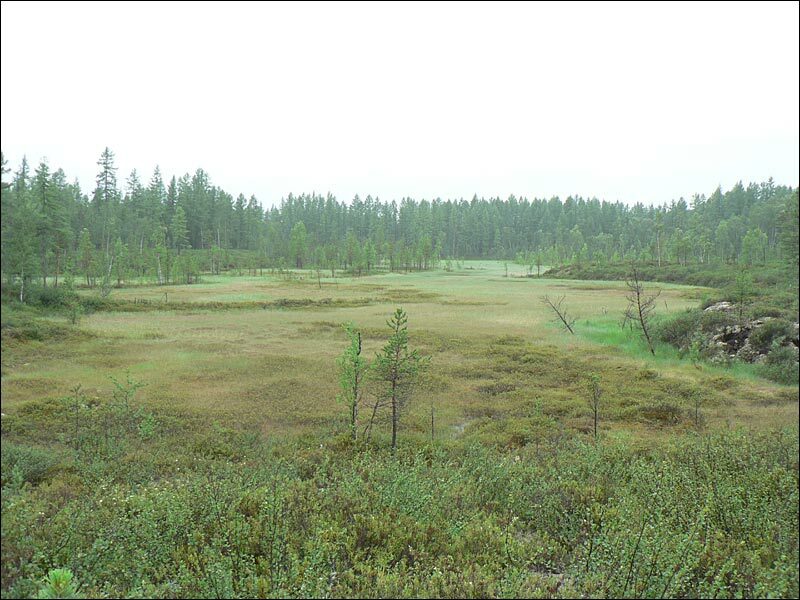 The problem for the meteorite interpretation of the Tunguska is that there are some hints that the depressions were formed in about 1908. 3.Tunguska - 95 (photo by S.Ipatov). 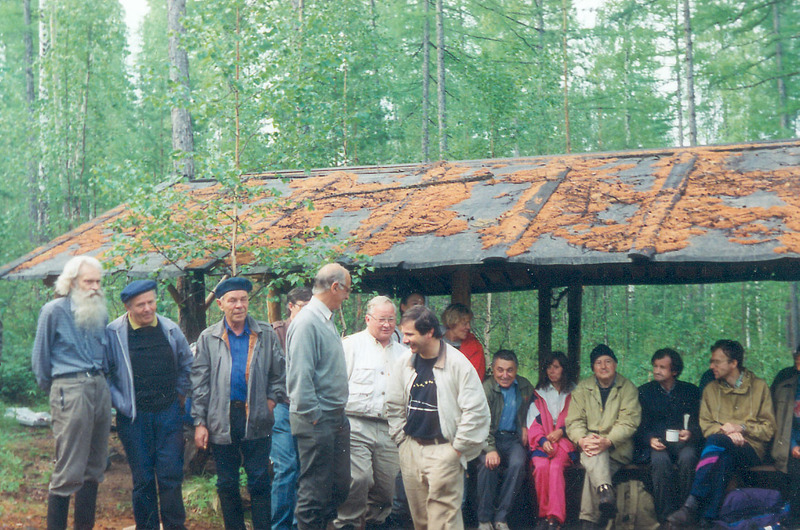 You can see some participants of the Tunguska-95 International conference visiting the Tunguska epicenter. On the foreground (from the right to the left) the first person is Dr. Mark E. Bailey, the third (the tallest) Dr. S.V.M. Clube. The 'leftest' (with a beard) is Wilgelm Fast. Also you can see me, the 'rightest' man sitting on background. Yes, here you can see me much better than on the picture 3. 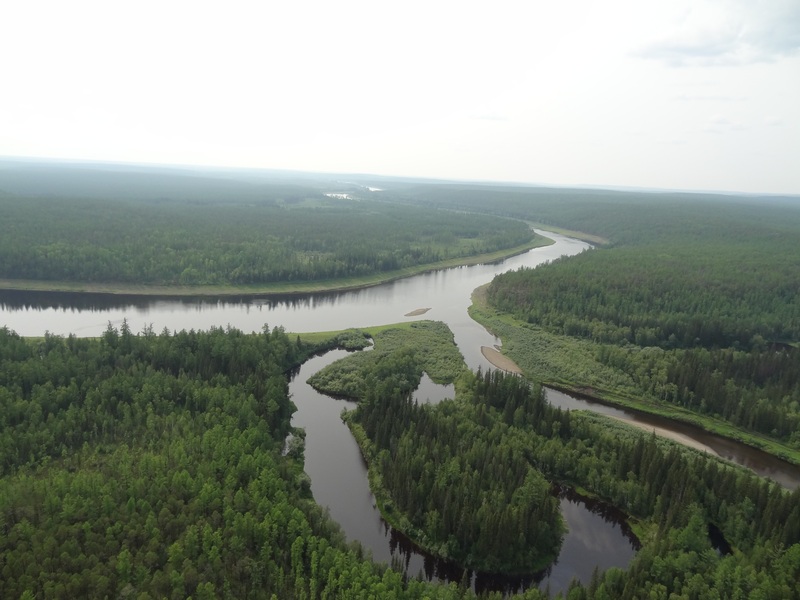 Besides me, there is also the Vanavarka river mouth, where it gets to the Podkamennaya Tunguska river. 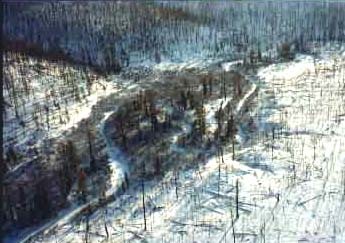 It is at the Vanavara village (70 km to the SE of the Tunguska epicenter) during the 1998 International conference on Tunguska. 5. 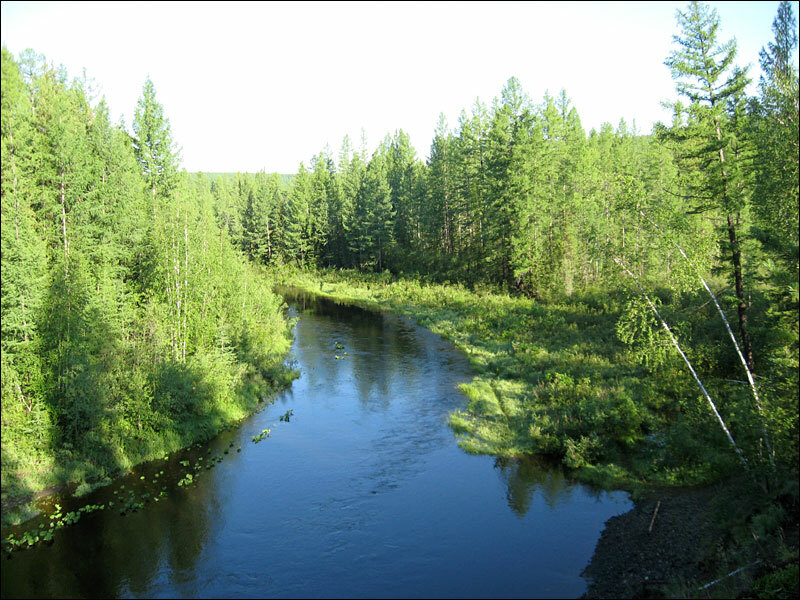 A river in taiga. 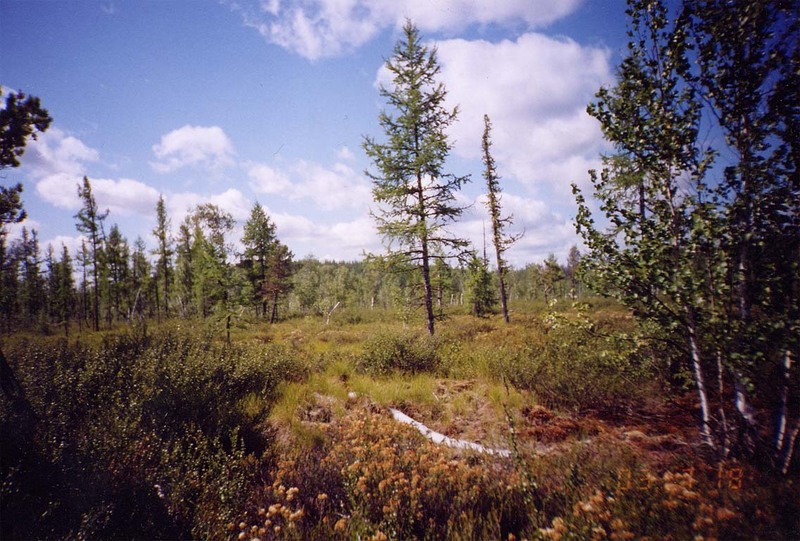 This photo by Sergei Ipatov shows how nice is taiga at the Tunguska epicenter. But please, remember, that mosquitos can't be pictured this way! 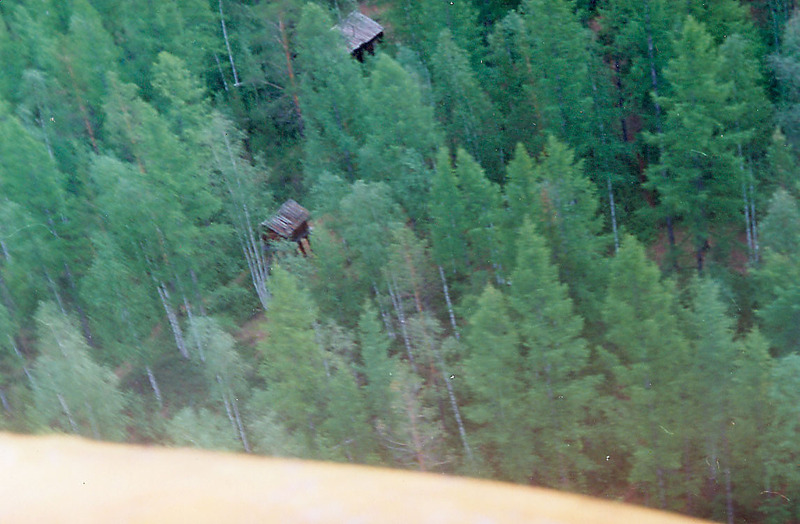 6.A helicopter over the Tunguska epicenter. 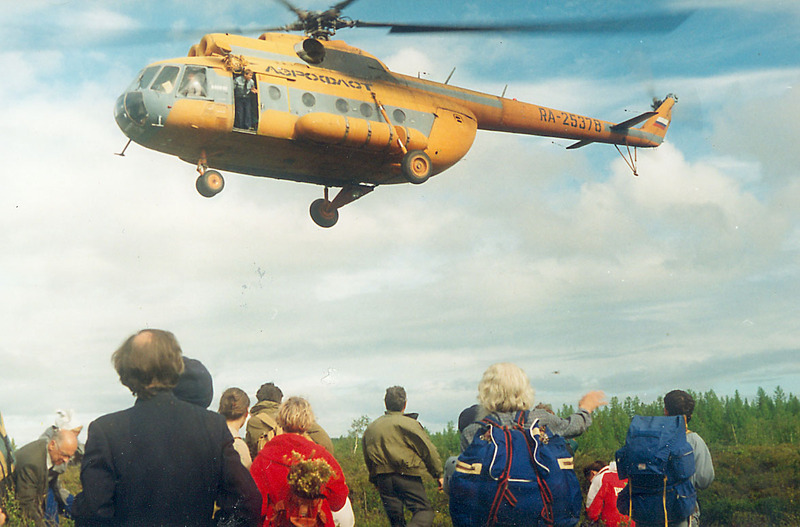 Here Sergei Ipatov pictured a Mi - 8 helicopter hovering over the Tunguska epicenter to take participants of the Tunguska - 95 International conference. 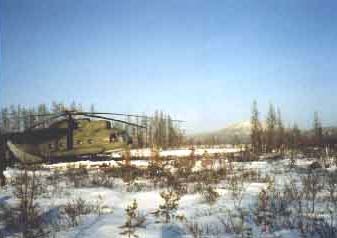 The landing site is a swampy area, so a helicopter has not to land, but just touch the ground, and keep on hovering. 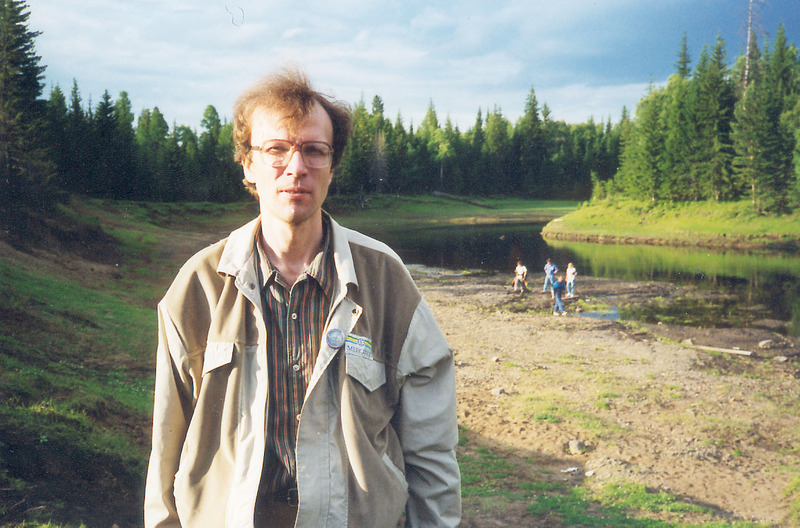 Sergei Ipatov took the photo a short after taking off from the Tunguska epicenter during the end of the Tunguska - 95 International conference. 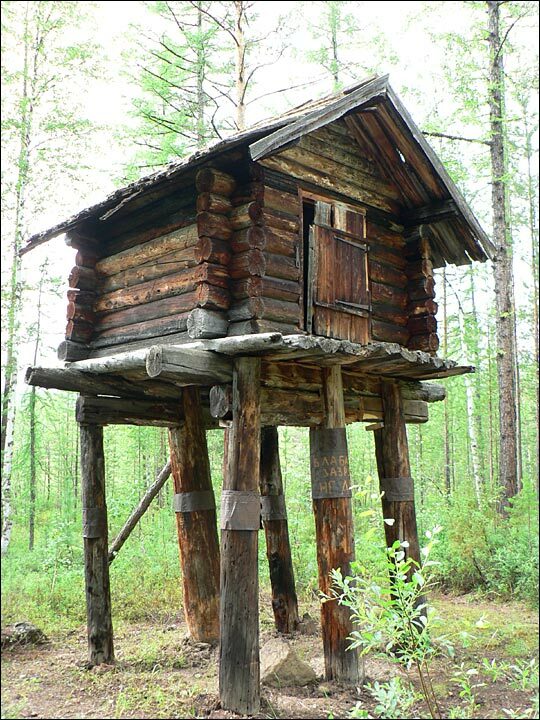 You see Kulik's huts 'hidden' in taiga. 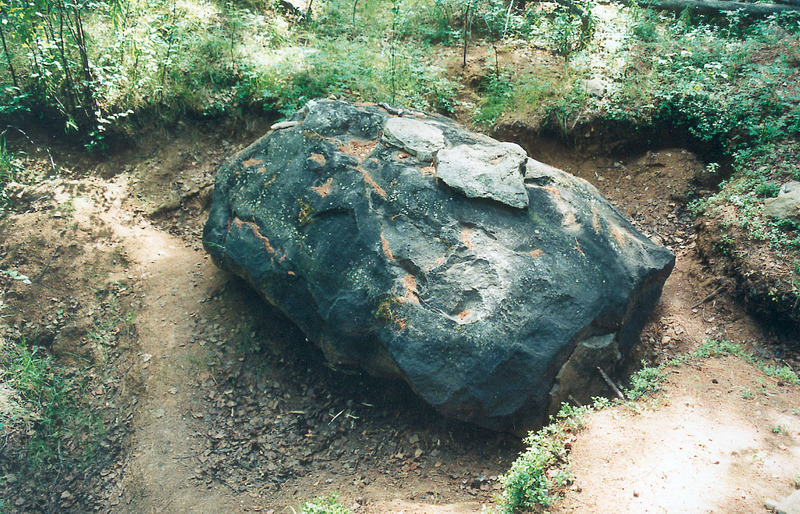 8.Again 'Tunguska meteorite'(photo by V. Romeiko). 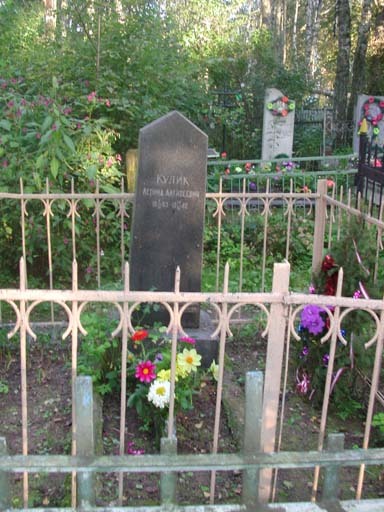 This stone was discovered in 1972 by John F. Anfinogenov. 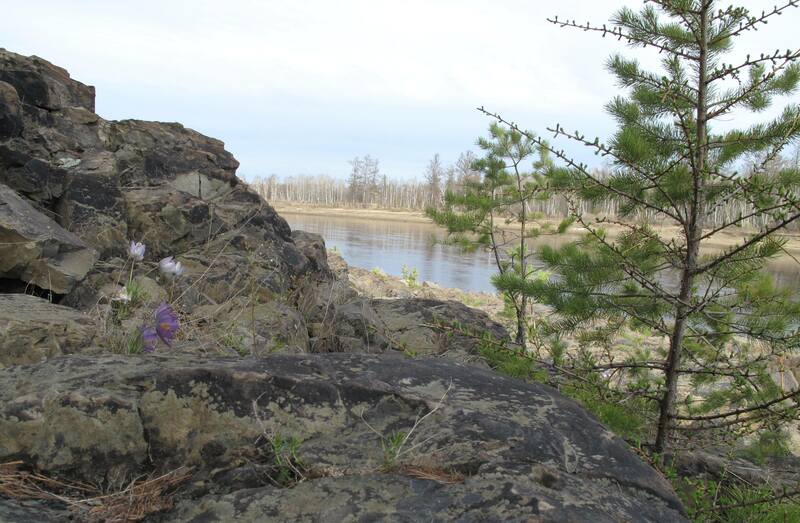 It is a terrestrial stone, but there are some problems with its appearence in the Tunguska epicenter. 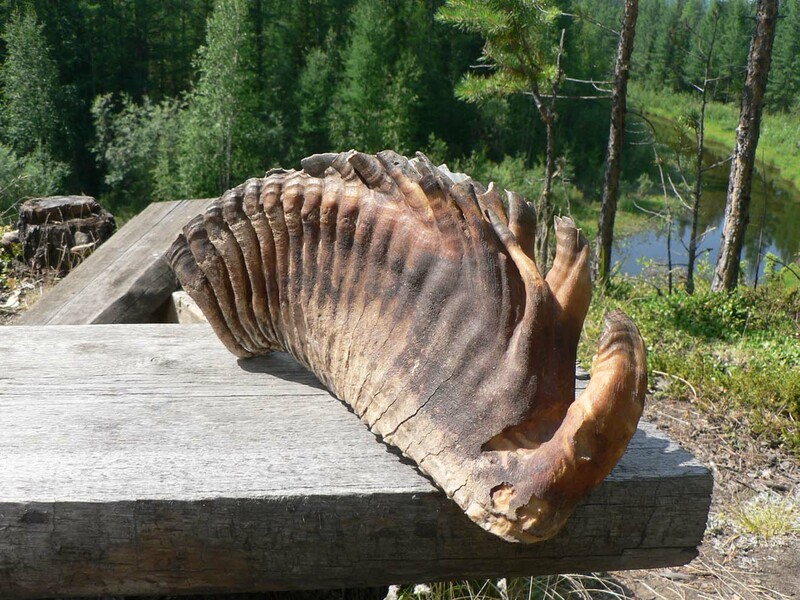 You can read about the stone (used to be called the John's stone) at abstracts by Anfinogenov et at., and B. Golubov..
9.The mute witnesses of the Tunguska event (photo by V. Romeiko). 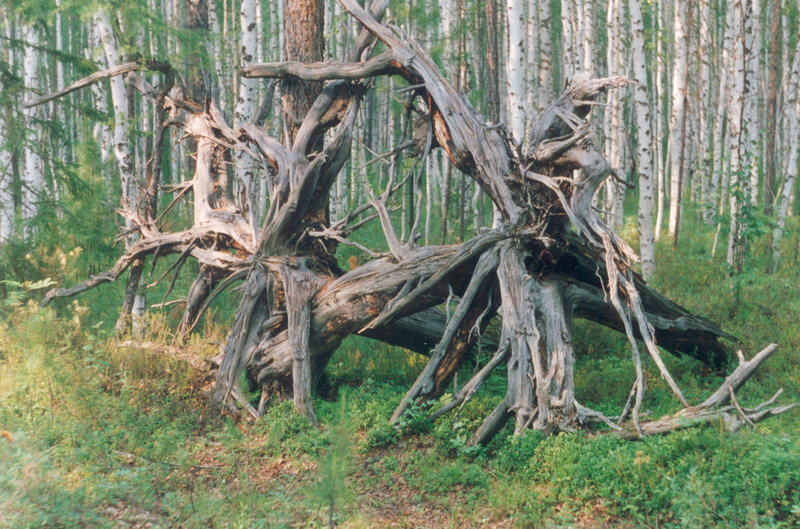 These are the rare survived remnants of trees fallen during Tunguska. 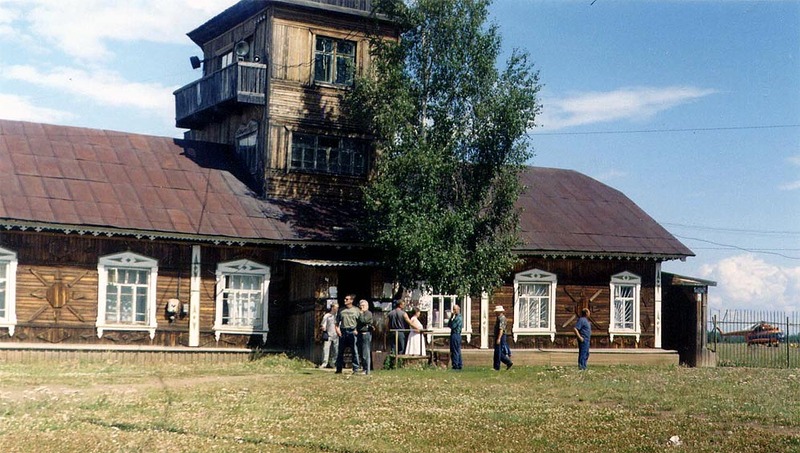 They are rather popular and many visitors of the Tunguska epicenter take their photoes. 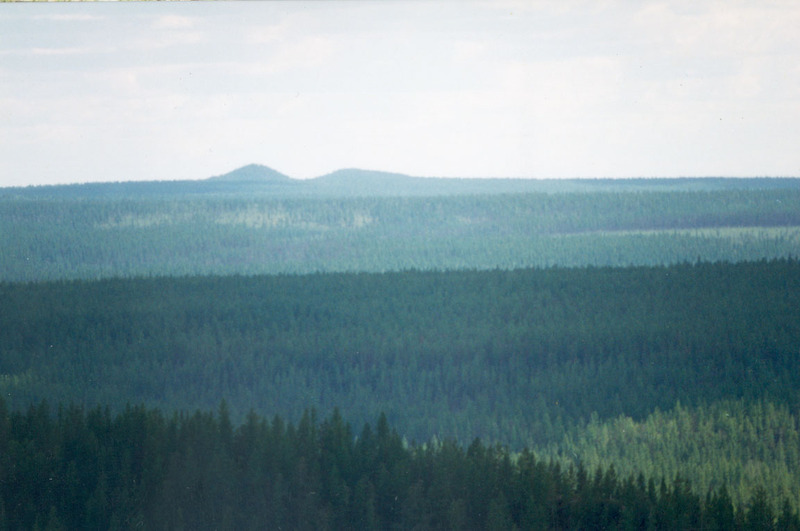 10.General view of the Tunguska epicenter (photo by V. Romeiko). 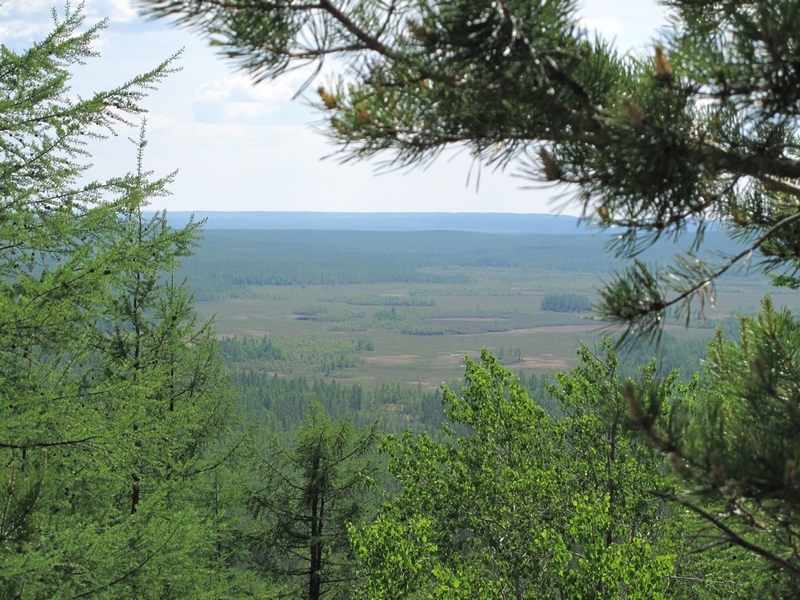 You can see surroundings of the Tunguska epicenter. No visible traces of the 1908 event, just taiga! The nearest settlement (Vanavara) is 70 km away. 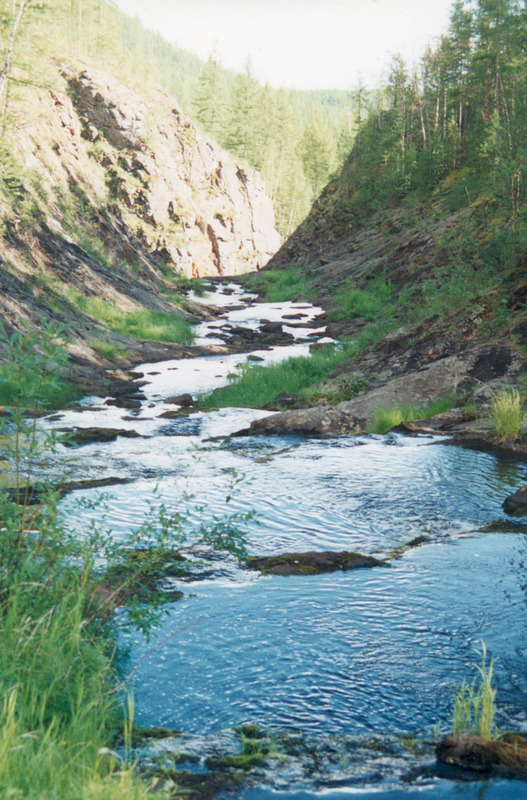 11.A nice view of Churgim creek (photo by V. Romeiko). 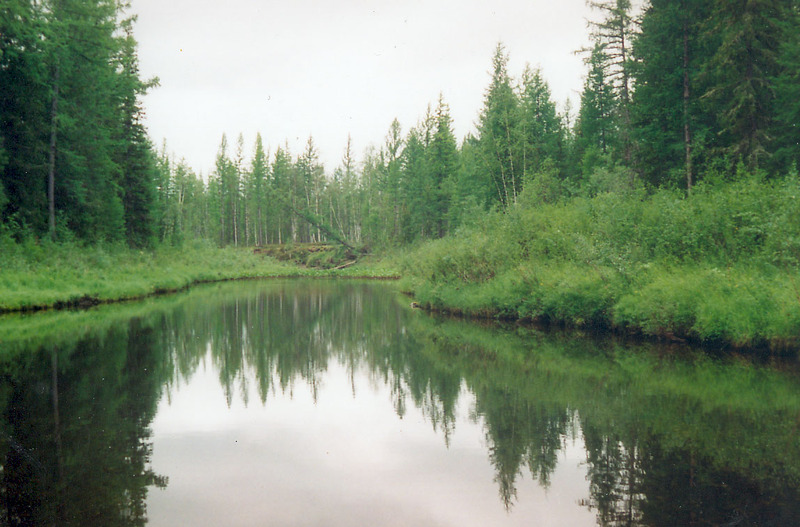 It is said that before the Tunguska, the creek (which is in the epicentral area) was very weak and used to dry up in summer. 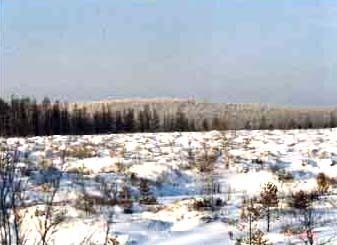 This unusual picture of Tunguska was taken in November 1999 during a visit of Japanese TV crew into the Tunguska epicenter. 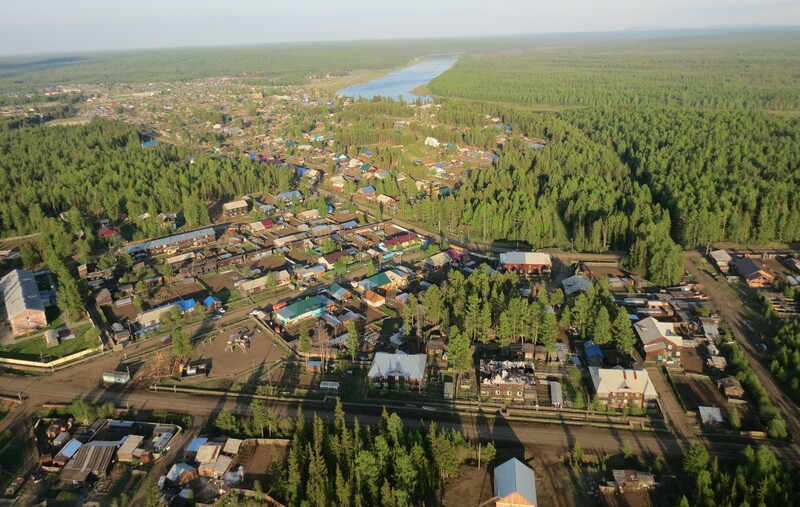 You can see a helicopter, on which participants flew from Krasnoyarsk (about 800 km). Pictures 12-22 were supplied by Boris Bidyukov. 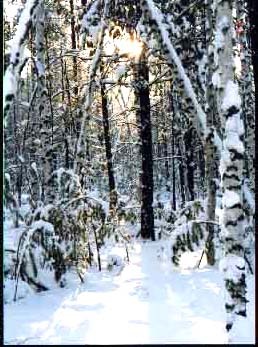 Another winter picture of Tunguska in November 1999 during the visit of Japanese TV crew into the Tunguska epicenter. It was taken from the helicopter. This picture is one of my favourites. I hope you will appreciate it too. 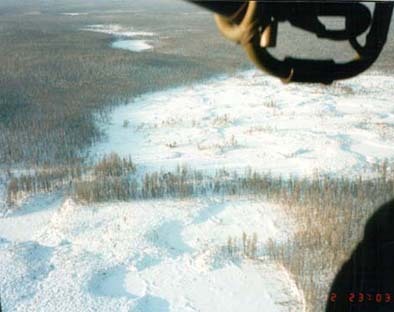 In November 1999 Ugakita river in Tunguska was covered with ice already. Looking at this November Tunguska picture, can you imagine how did L. Kulik investigate Tunguska in late 1920s for some time alone (and a frost was as strong as -56 C) ? 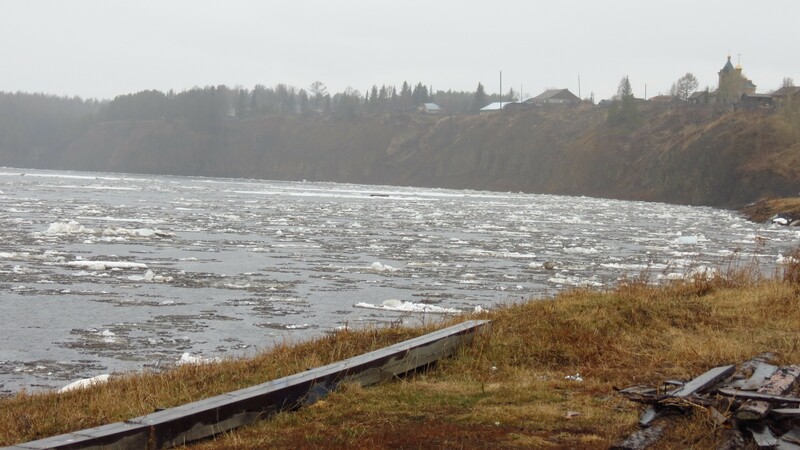 One more interesting pictire of the near-epicenter river. No, he isn't a local resident. 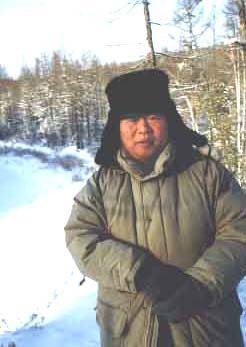 He is Mr. Takashi Tachibana, leader of TBS group, standing of the bank of Khushma river near the Tunguska epicenter in Nov. 1999! 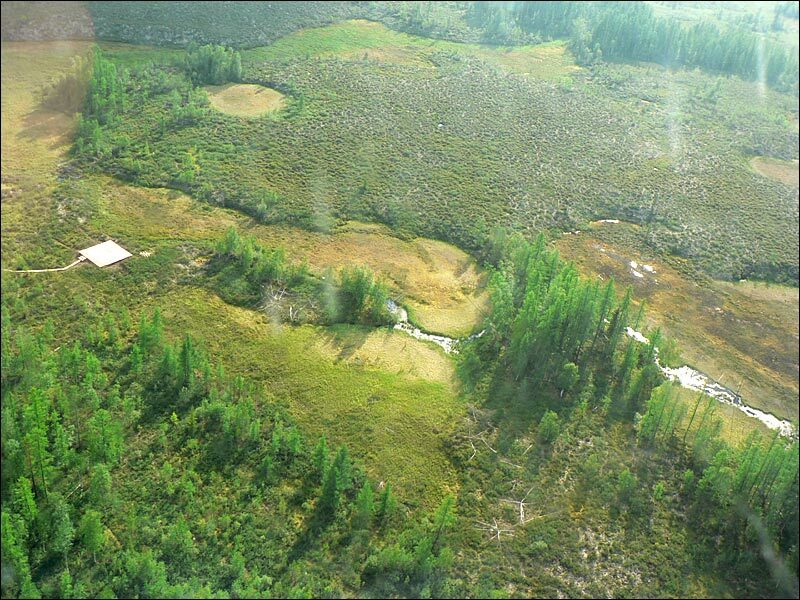 Majority of Tunguska investigators doesn't see the swamp near the Tunguska epicenter in such shape. 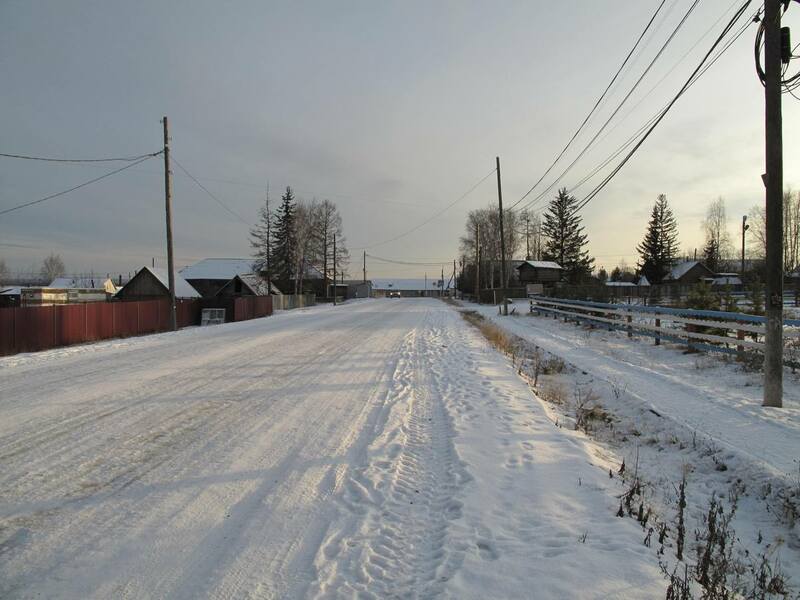 A winter is practically the only time of an year, when it is possible to drive through taiga due to frozen ground. Such road is called 'zimnik'. 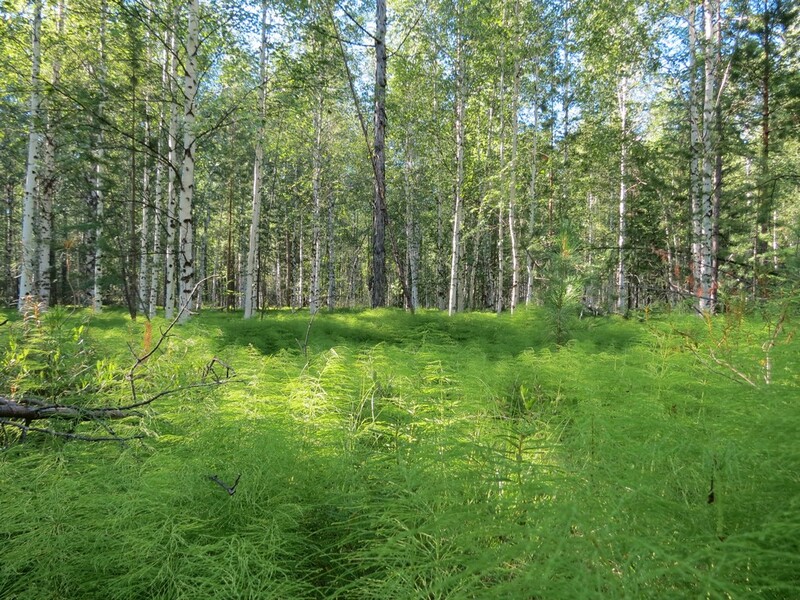 This forest-fall (16 km from the Tunguska epicenter) has no relation to the 1908 event. 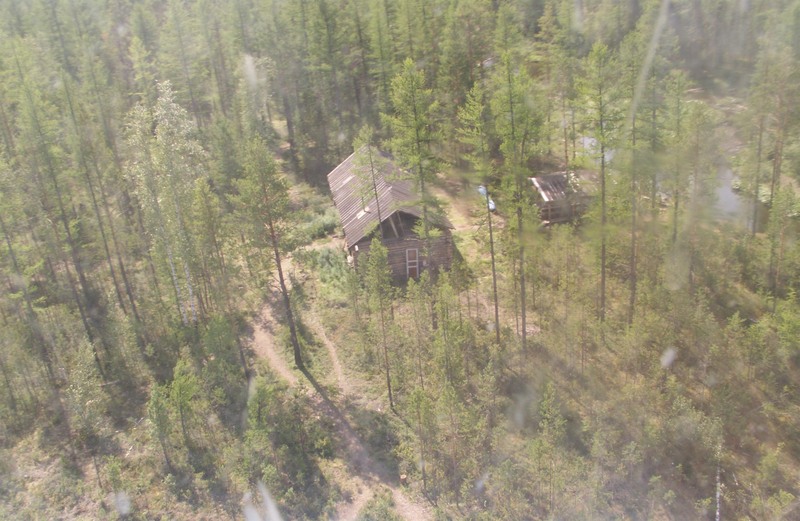 From this picture it is clear how difficult to investigate Tunguska nowadays, as many fresh forest-falls from fires superimpose on the 1908's one. 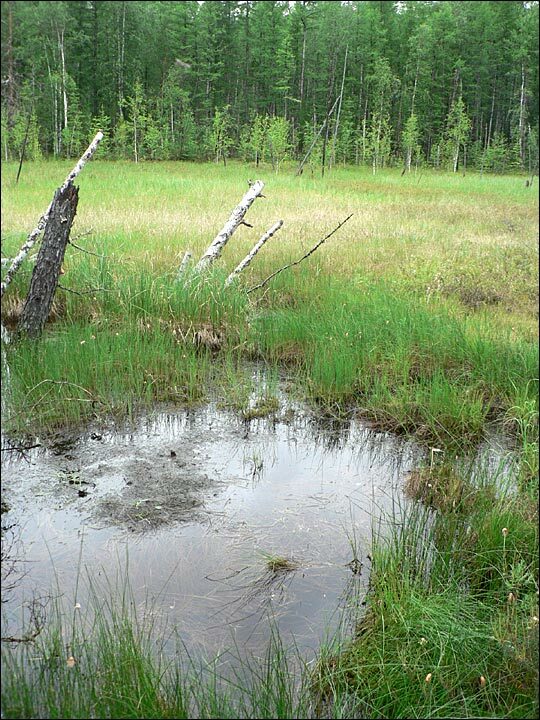 This swamp is near the Tunguska epicenter. 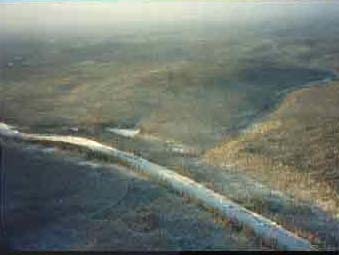 The picture taken in the mid-November 1999 from a helicopter. 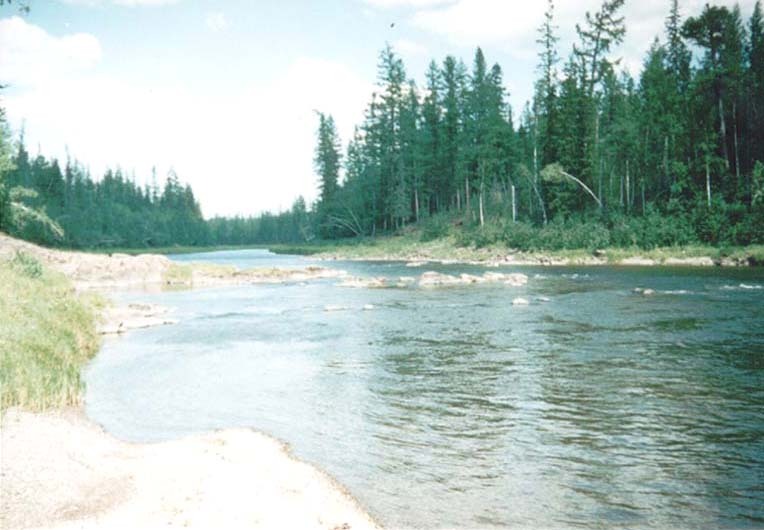 The rapids on Chamba river, not far from the Tunguska epicenter were pictured by S.Krivakov in 1996. 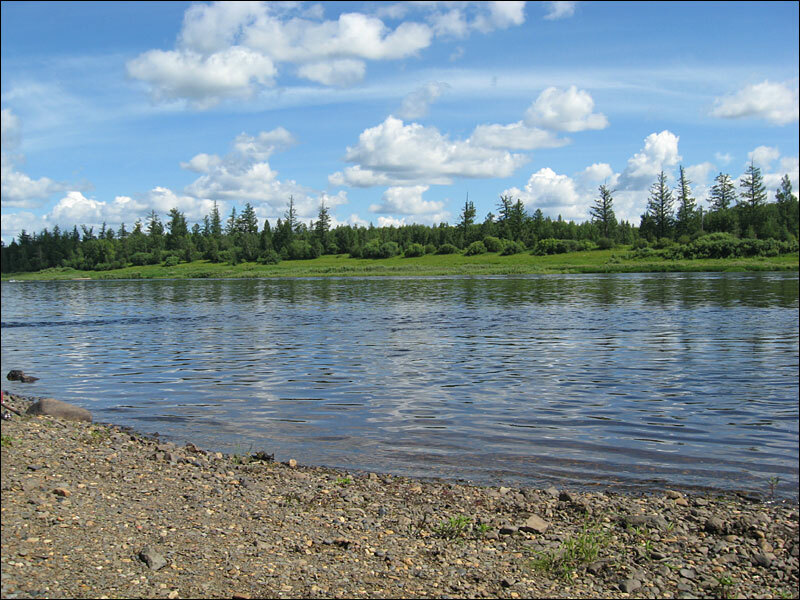 You can see a characteristic detail of many Siberian rivers - majority of rapids. 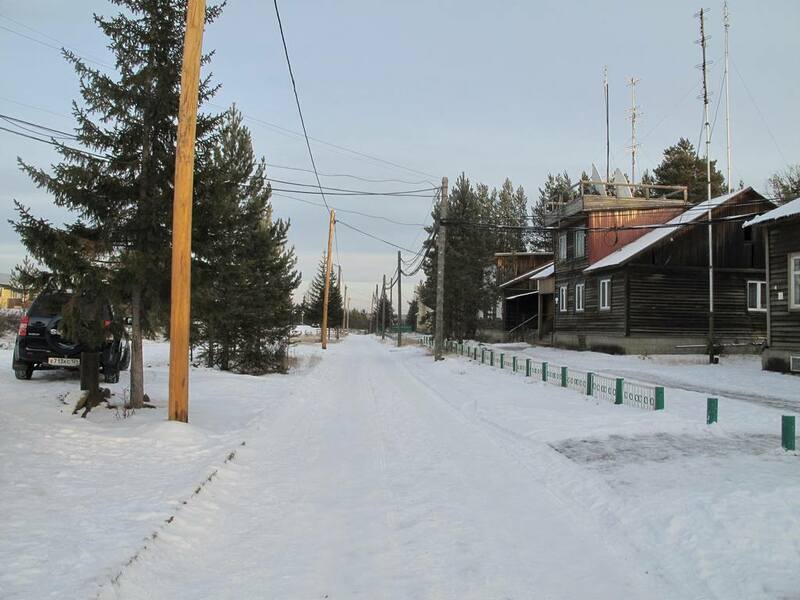 22.Restaurant "Tungusskii Gurman" is closed! 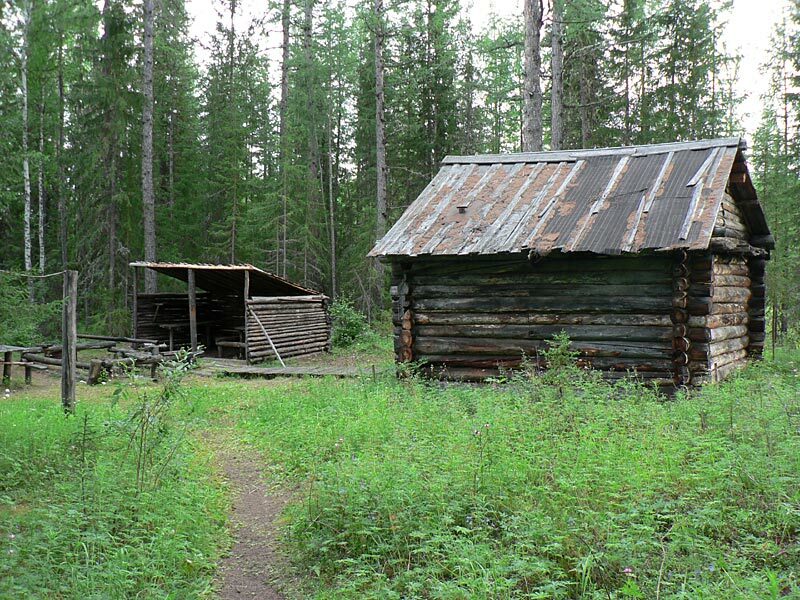 On picture 3 you already could see this place for taking meals in the Tunguska epicenter. 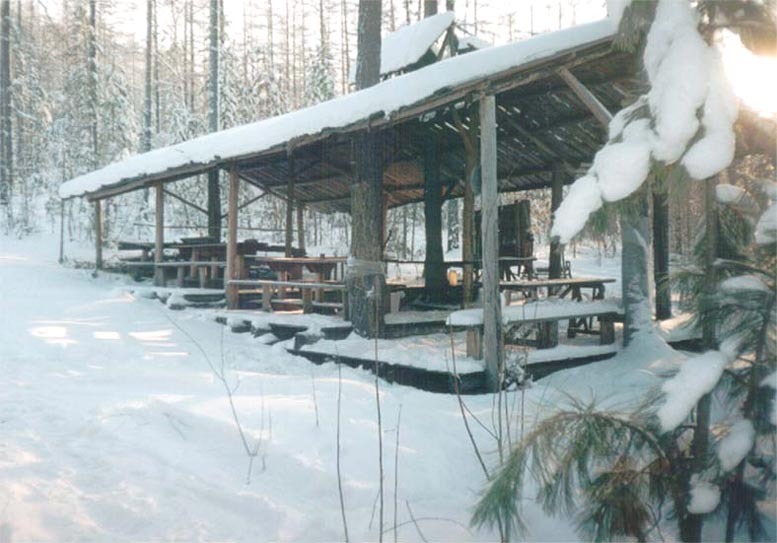 Here you can see it empty and under snow cover in mid-November 1999. Picture by B.Bidyukov. 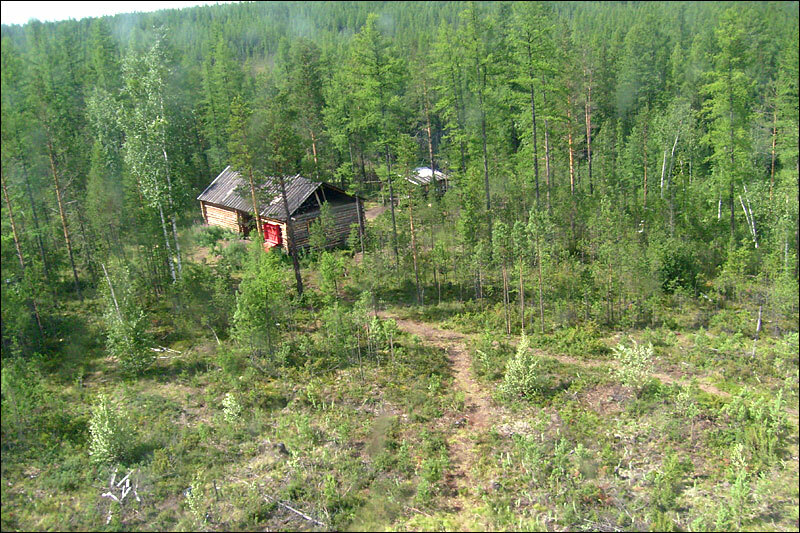 I got this picture directly from the Tunguska epicenter via satellite phone on May 28. 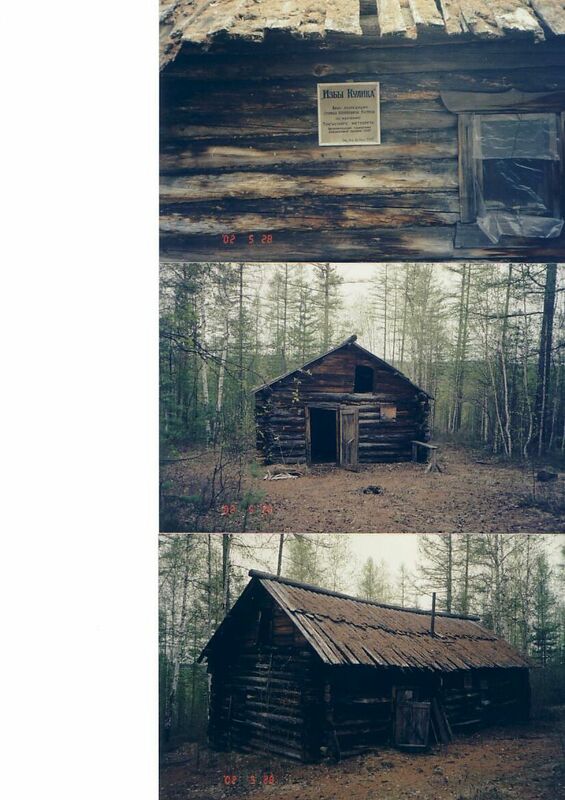 A collage of several pictures of Kulik's huts taken on May 28, 2002 by the Canadian-British-Russian group in the Tunguska epicenter, and sent to me by Elena Batygina. 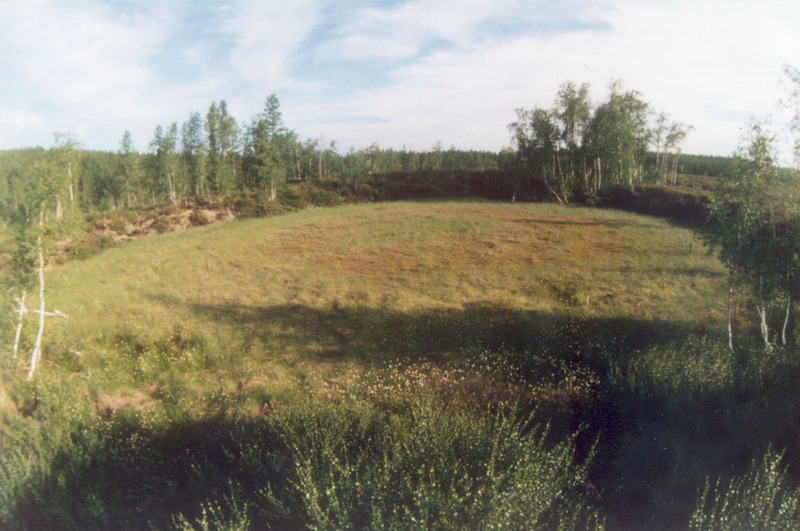 A collage of several pictures taken at the end of May, 2002 by the Canadian-British-Russian group in the Pristan' place, which is several kilometers from the Tunguska epicenter (and sent to me by Elena Batygina). 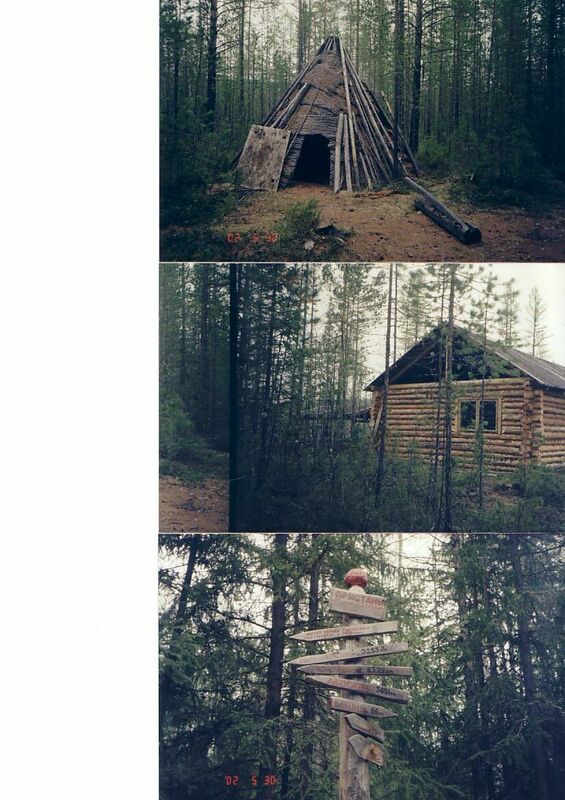 A collage of several pictures taken in 2002 by the Canadian-British-Russian group in the Tunguska region (and sent to me by Elena Batygina). 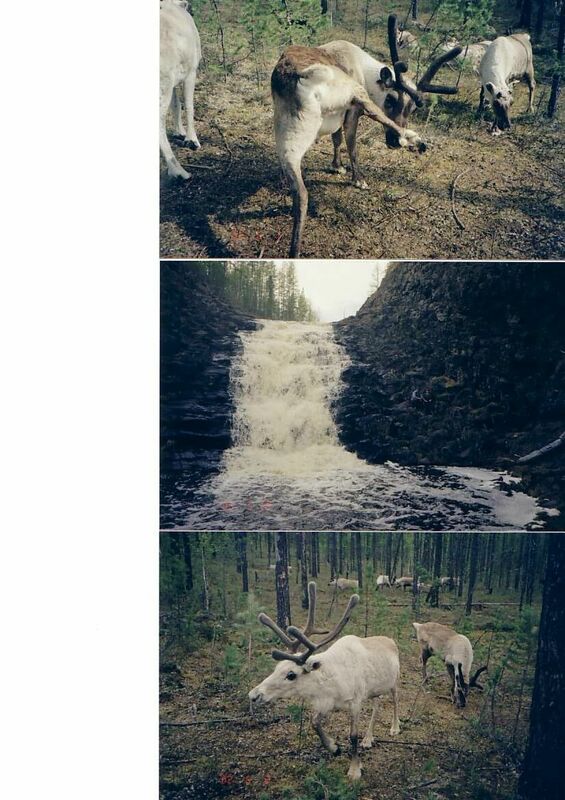 The watefall is a few kilometers from the Tunguska epicenter, while the reindeers were pictured a little bit farther. 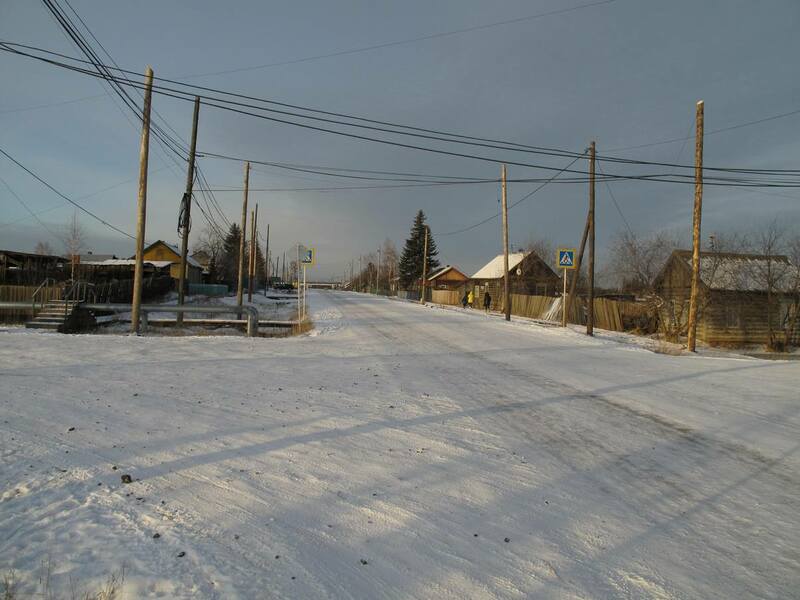 27.Pictures 1 and 2 of a place in a town of Spas-Demensk (about 300 km SW of Moscow ), where the first Tunguska researcher L.A. Kulik was buried after his death as a prisoner of war in 1942. 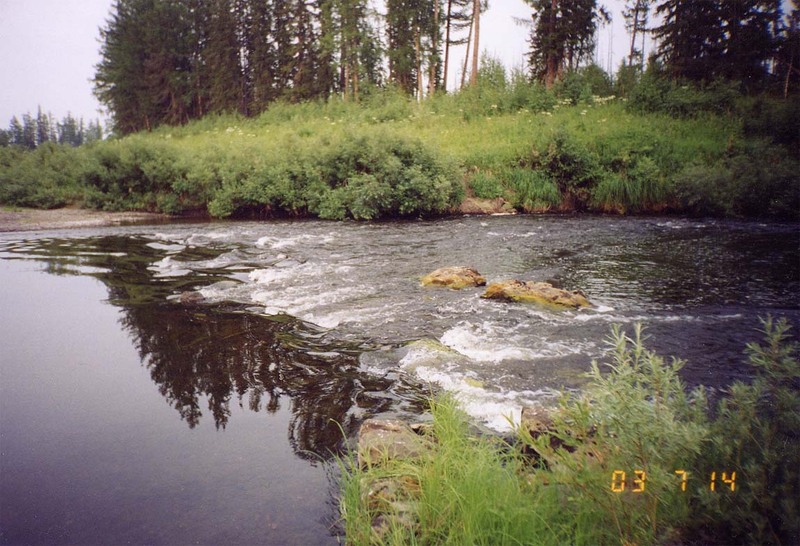 28.The Chamba river where it crosses so called the Kulik path. The latter is a path which Kulik was used to go to the epicenter from Vanavara. This picture was taken in 2003 by L. Pelekhan'. 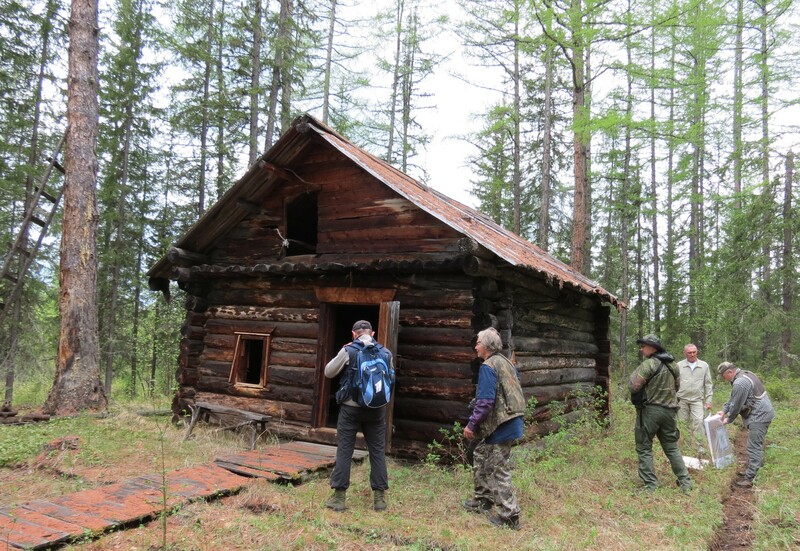 Yes, there are a lot of bogs in the area, and we couldn't miss them! This one was pictured by L. Pelekhan' in 2003. 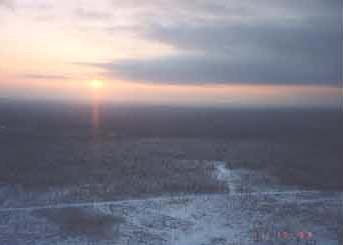 While failing to find any substance of "Tunguska meteorite", at least one Tunguska researcher was able to capture something else, also rather attractive. 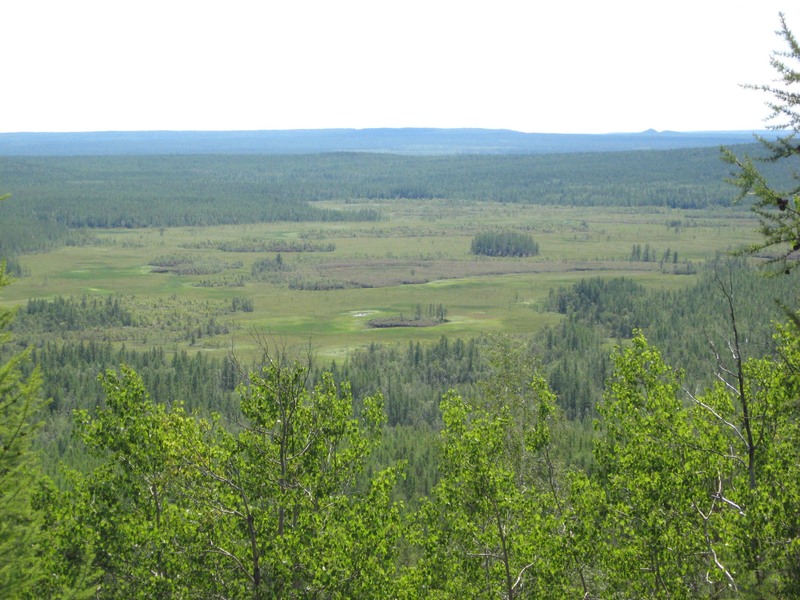 This "gift of Tunguska" can be considered as a partly compensation to Tunguska researchers for their work. The picture by L. Pelekhan' in 2002. 31. 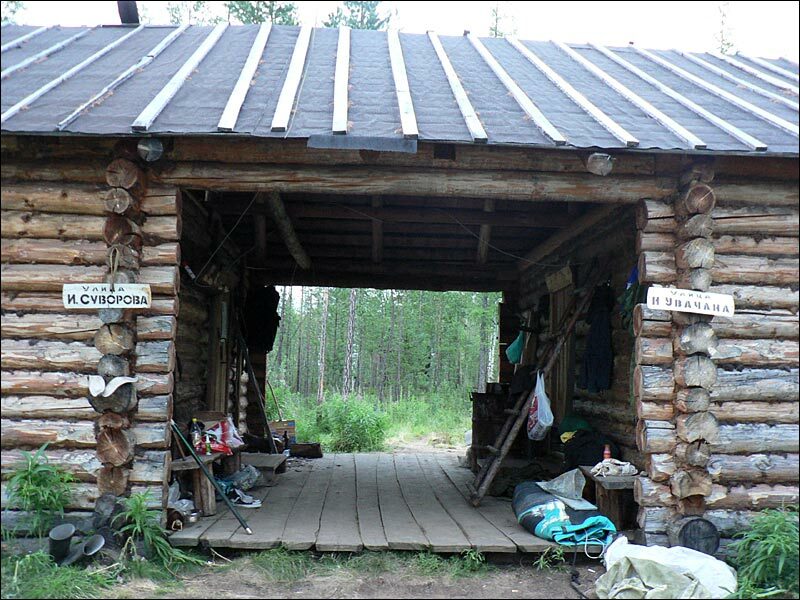 A house in taiga A picture of 'zimov'e' (a winter house for hunters etc.) 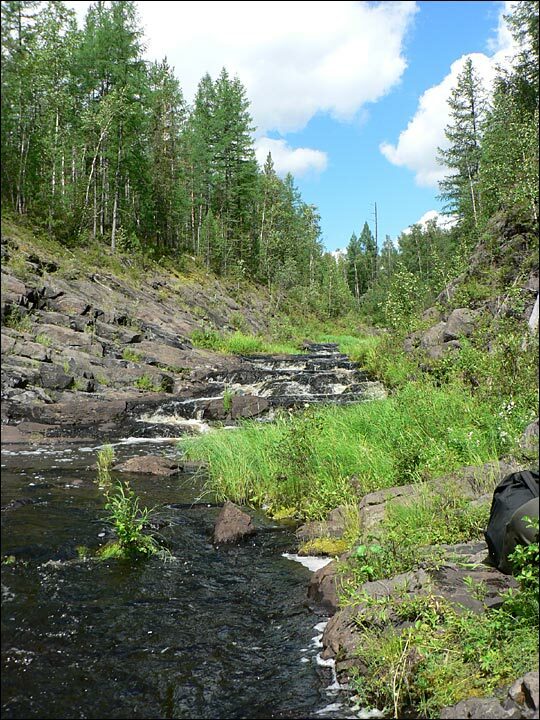 in the area of the Tetere river taken in 2004 by A. Chernikov. 32. Vanavara's airport A picture of the Vanavara airport taken by V. Zhuravlev in the summer of 2005. 33. 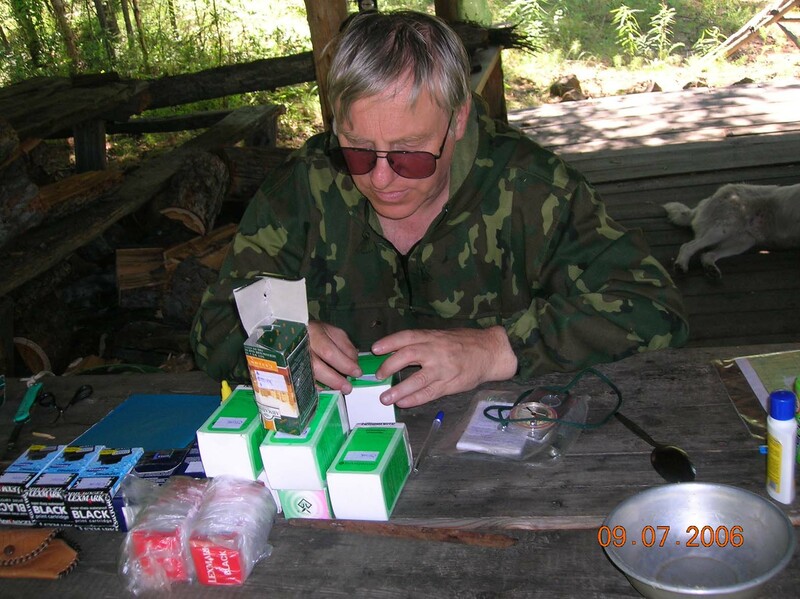 Digging for samples We can see V. Zhuravlev himself on this picture taken in 2004 by A. Fedorov. 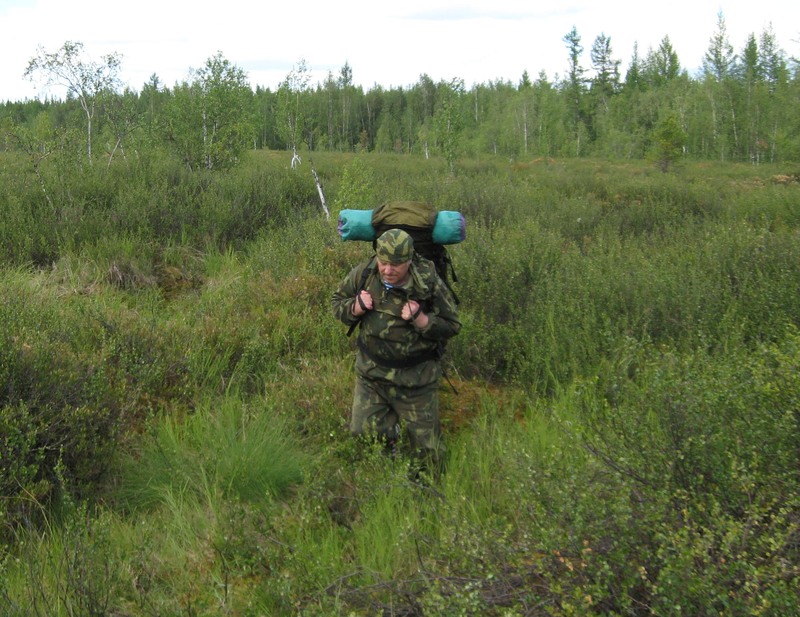 Zhuravlev is taking soil samples near the epicenter at the Lvov's bog/swamp. 34. I've got it! Not the hypothetical 'Tunguska meteorite', but just the sample. 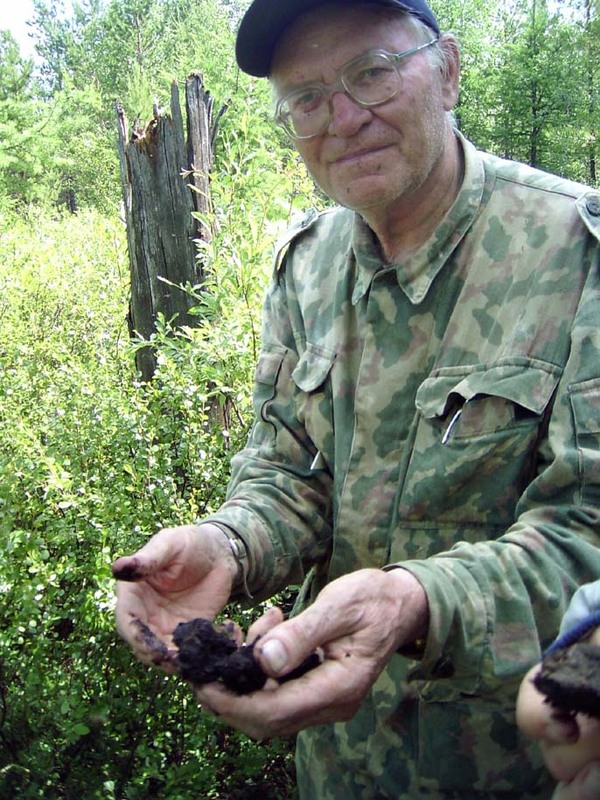 V. Zhuravlev with a soil sample from the permafrost depth (picture by A.Fedorov, 2004). 35. Preparing a meal in taiga Those who are interested the expedition's everyday life could be interested to look at how A.Chernikov and V.Trusov are preparing their meal (and please, don't think that the person is wondering whether he has confused a battle of oil with vodka in the dark!...) 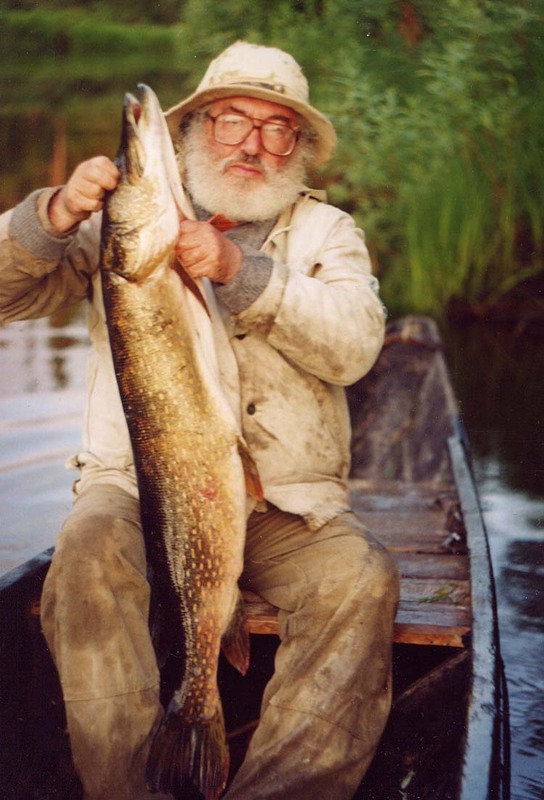 (picture by A.Chernikov, 2004). 36. Looking tasty! 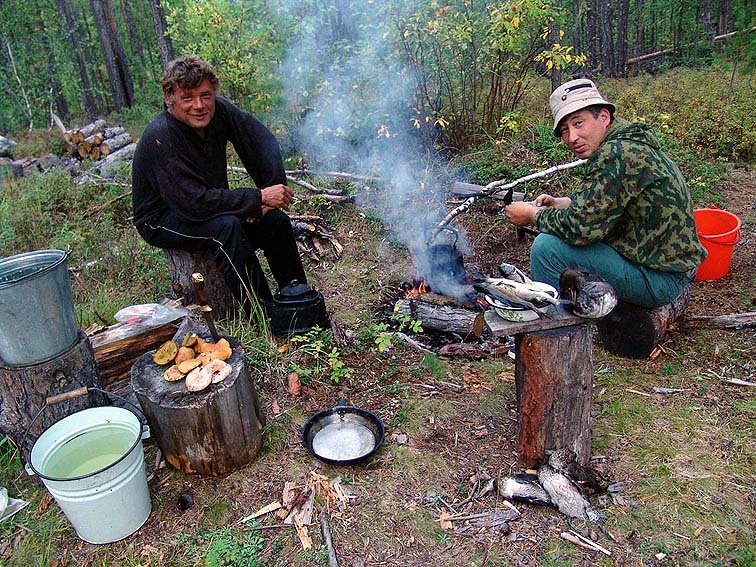 Another 'cooking in taiga' photo featuring A.Chernikov and I.Doroshin (picture by A.Chernikov, 2004). 37. Taking soil samples You could see pictures (above) made by Boris Bidyukov during an unique 'snowy' trip to Tunguska by Japaneese TV-crew. 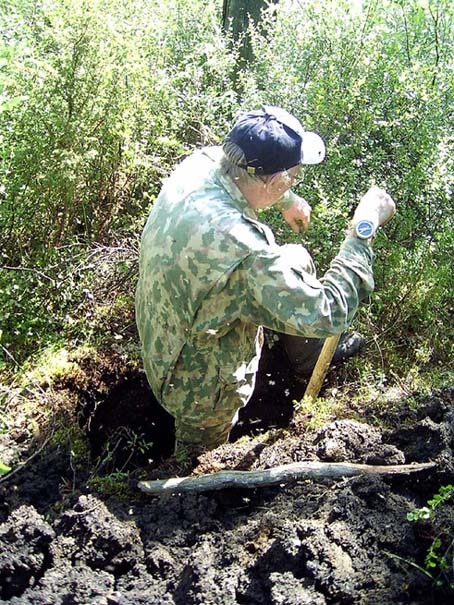 Now you can see Boris Bidyukov himself while he is taking soil samples during the Tunguskan summer of 2006 (picture by S. Krivyakov). 38. 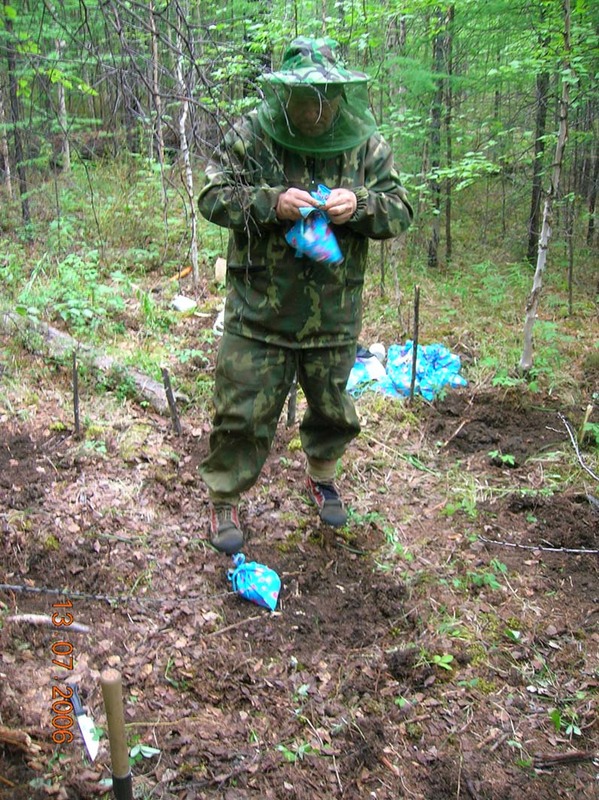 Packing soil samples On this picture Boris Bidyukov is packing the soil samples (picture by S. Krivyakov). 39. 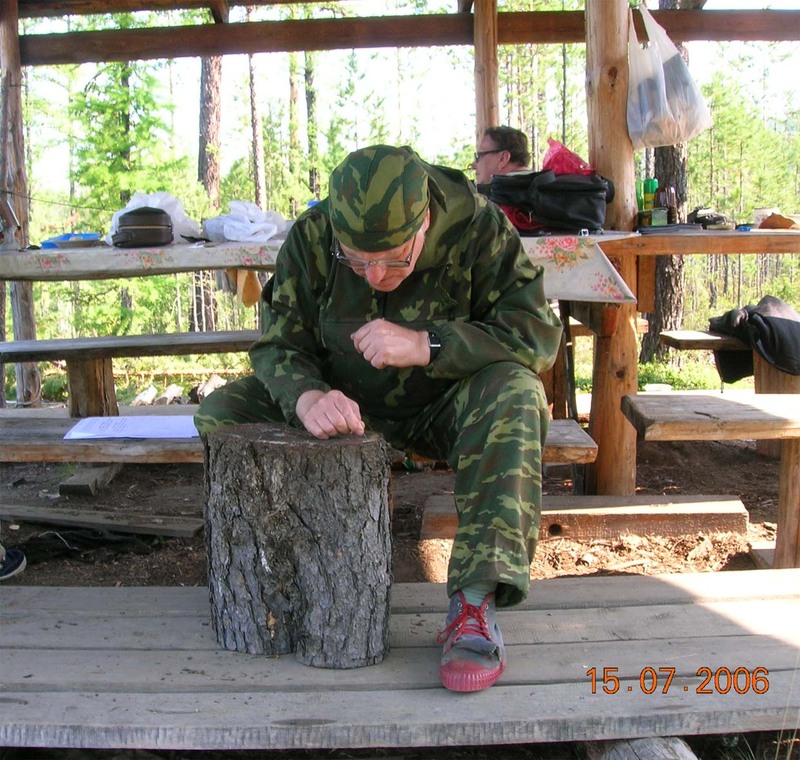 Counting tree's rings On this picture Boris Bidukov is counting larch's rings (picture by S. Krivyakov). 40. Mammoth's tooth While researchers failed to find any 'Tunguska spacebody substance', they have succeeded in discovery of a mammoth's tooth which was found on the banks of the Khushma river (picture by L. Pelekhan'). 41. Washing out of a soil sample On this picture you can see washing out of a large soil sample (picture by L. Pelekhan'). 42. More washing out of a soil sample Boris Bidyukov is taking part in preparing soil samples (picture by L. Pelekhan'). 43. Rain over the Khushma river Despite that the picture is rather dark unfortunately, it still shows the beauty of the taiga. 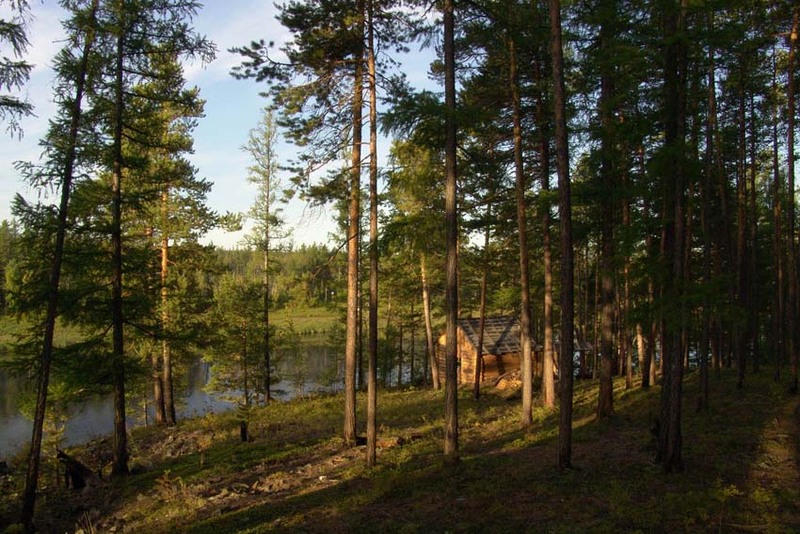 But I admit that the most important thing for Tunguska researchers is absence of mosquitoes etc. during the rain! (picture by L. Pelekhan'). 44. 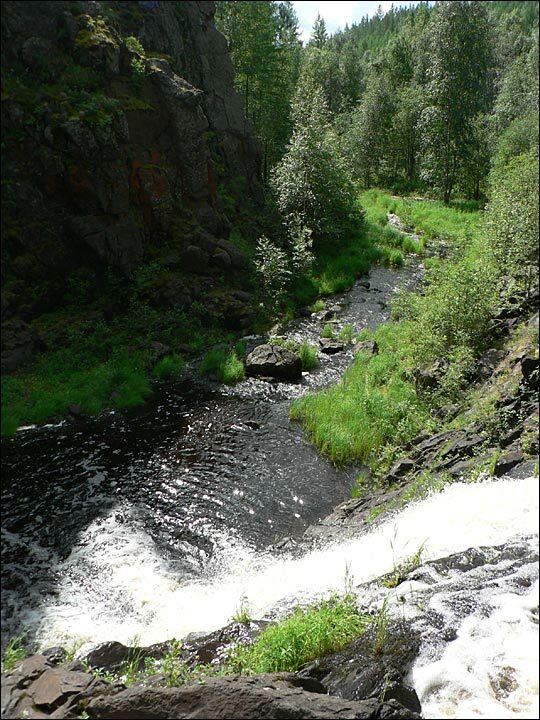 A beautiful picture of the Churgim waterfall taken in the summer of 2007 by N. Lebedeva In my opinion the waterfall is one of the most beautiful places in the area that's why I show it again and again. 45. 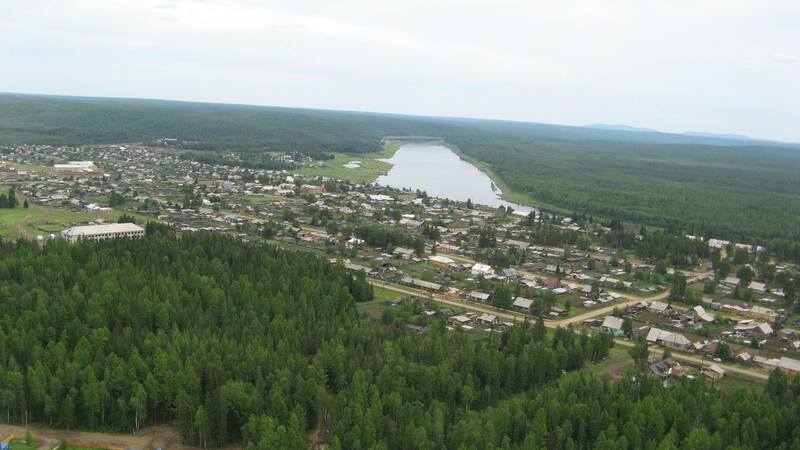 Looking from above A picture shot from a helicopter taken by N. Lebedeva in the summer of 2007. 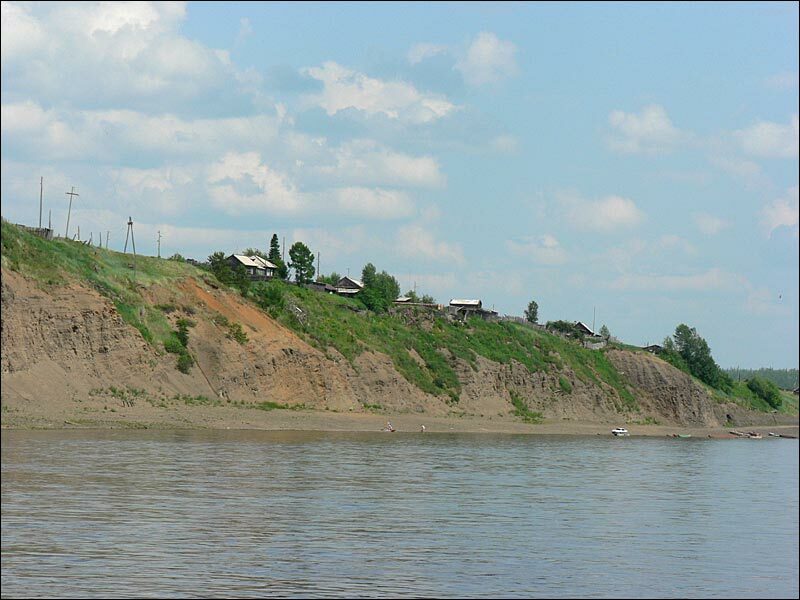 The place is called 'Pristan' ('Quay') as it is the closest to the epicenter place could be reached by a river. 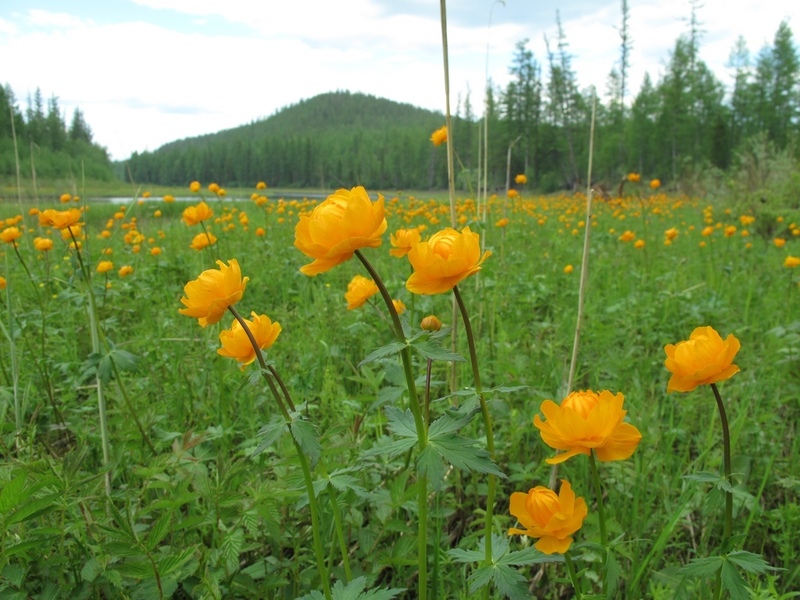 The picture is taken by N. Lebedeva. 46. 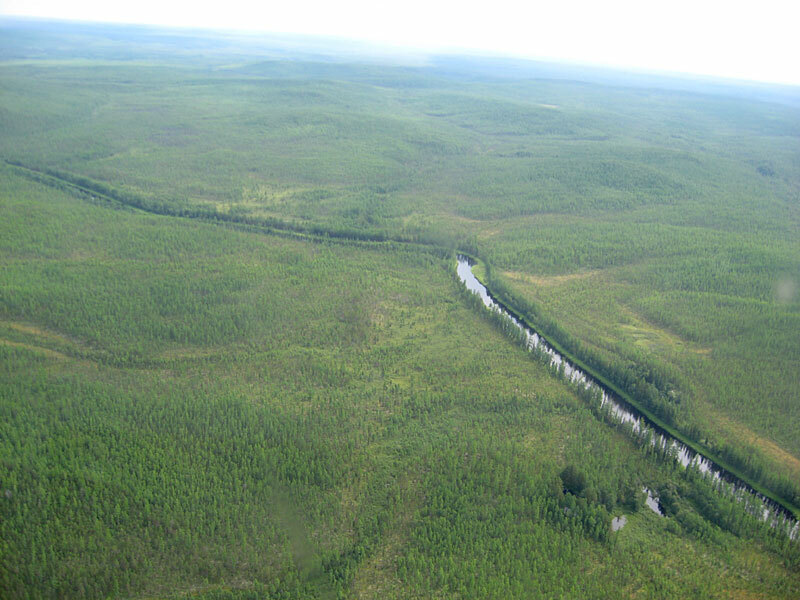 The Southern swamp A good picture (taken in the summer of 2007) of the Southern swamp where 'the epicenter of the Tunguska event' is placed (picture by L. Pelekhan'). 47. 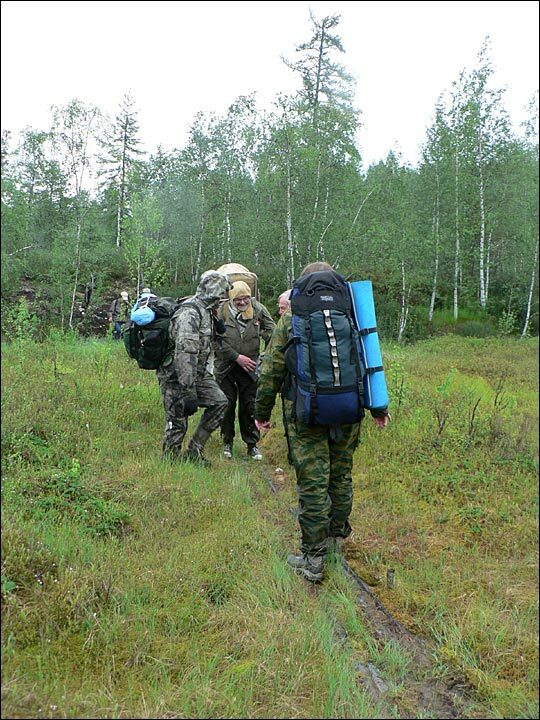 Boris Bidyukov is on his route A picture demonstrating how the Tunguska researchers are used to move in the region. 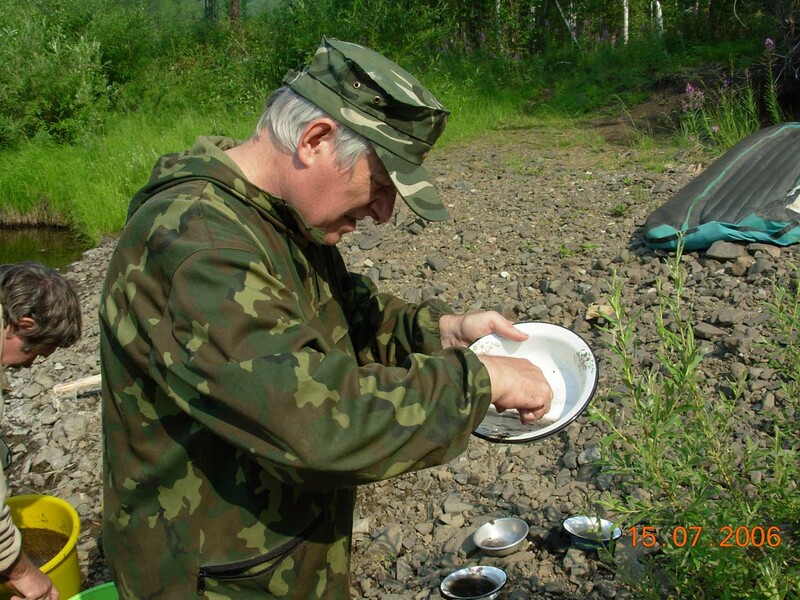 Boris Bidyukov is an experienced Tunguska researcher and travelled in there a lot. 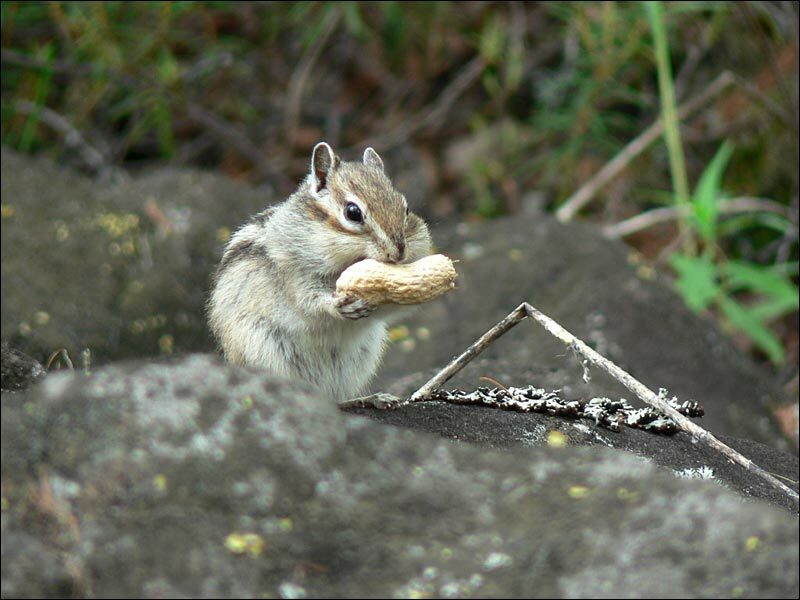 This picture is taken by L. Pelekhan' in the summer of 2007. 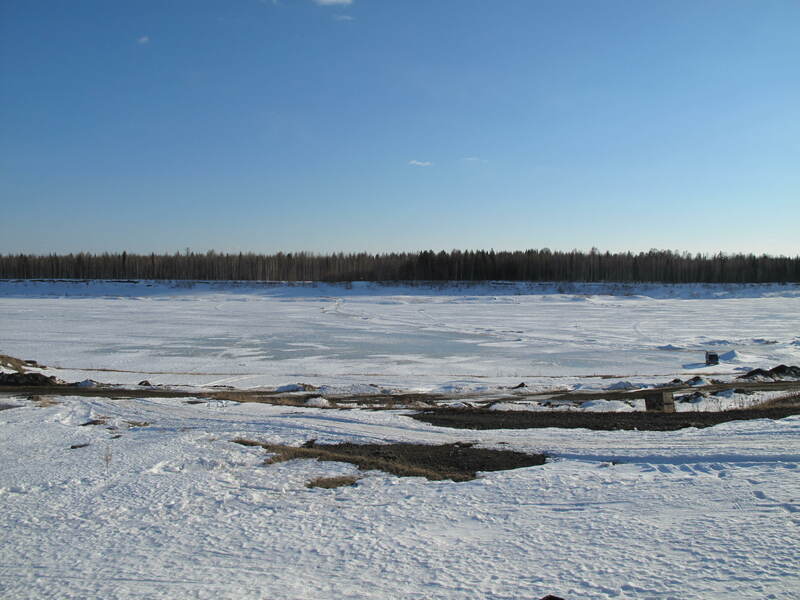 The next series of pictures were taken in the Tunguska event area during its 100th anniversary, i.e. around June 30, 2008. I have excluded official ceremonies, and have concentrated on nature. 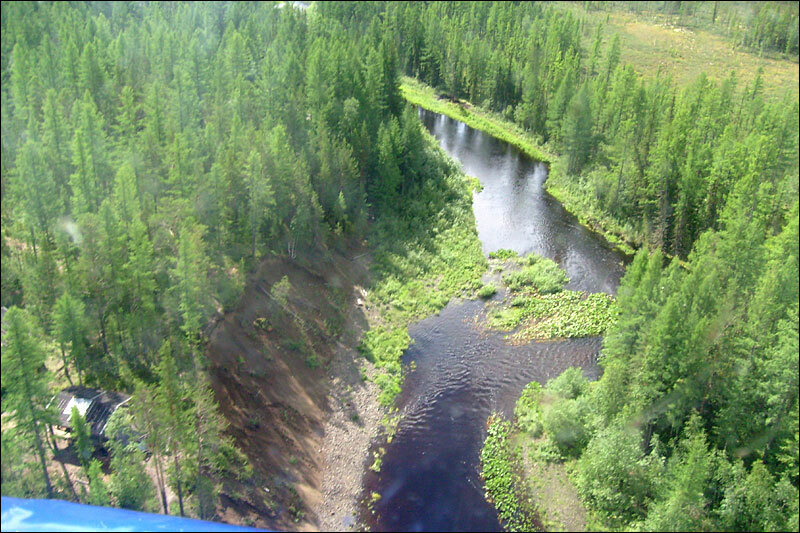 - This and this pictures show an area near to Zaimka Kulika (~1 km from the epicenter of the Tunguska expolosion) taken from a helicopter (pictures by V. Bidyukova). 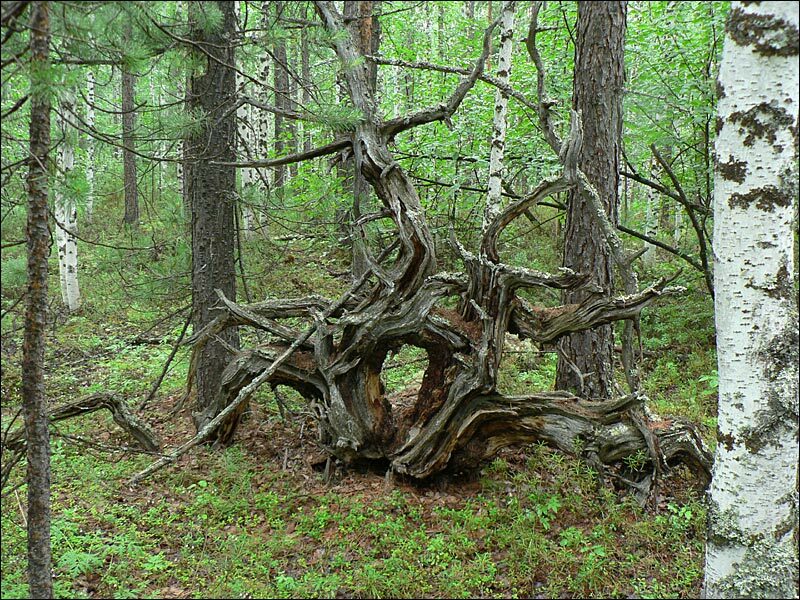 - This and this pictures show rare view - remnants of a tree fallen in 1908 (pictures by V. Bidyukova). 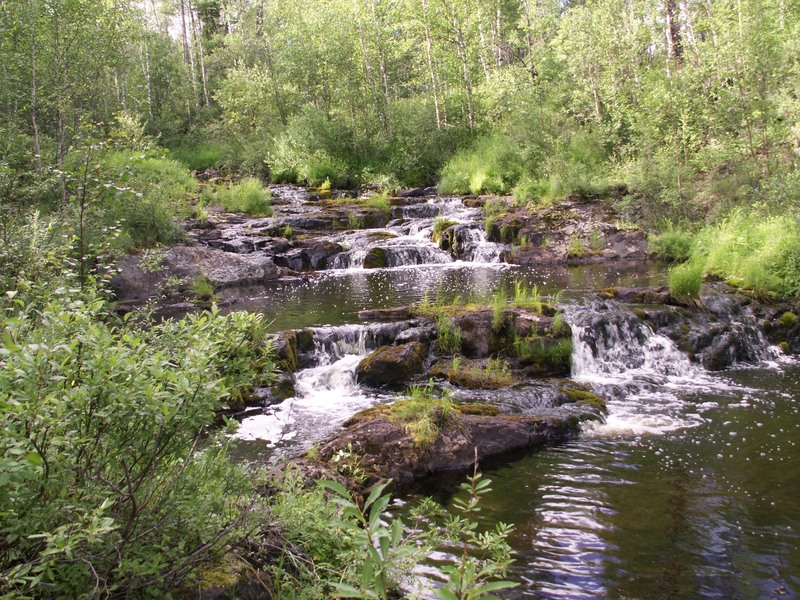 - This picture shows Churgim creek (and waterfall) (picture by V. Bidyukova). 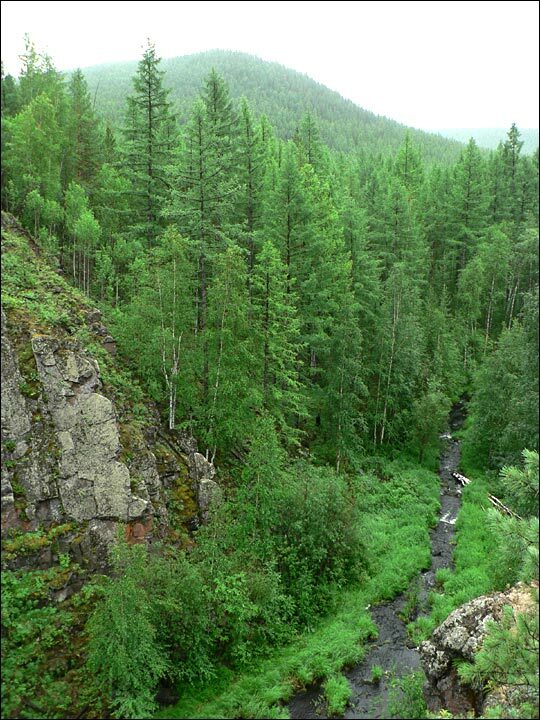 - This picture shows Churgim creek more closer (picture by L. Pelekhan'). 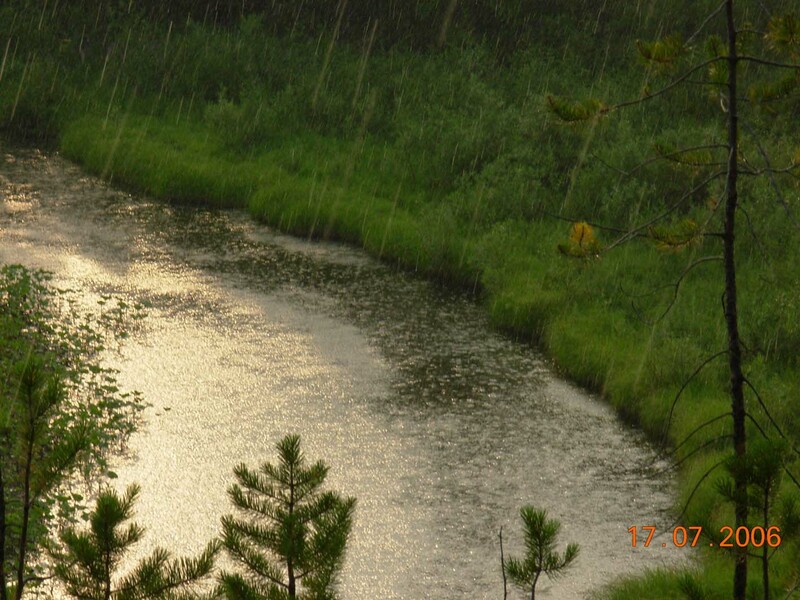 - This picture shows a local swamp (picture by V. Bidyukova). 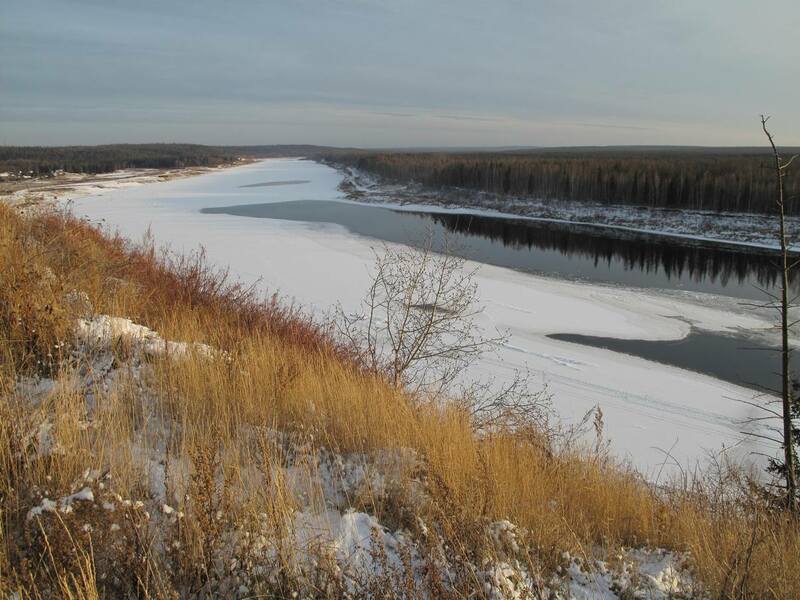 - This picture shows the Stony Tunguska river seen from the Vanavara settlement (picture by V. Bidyukova). 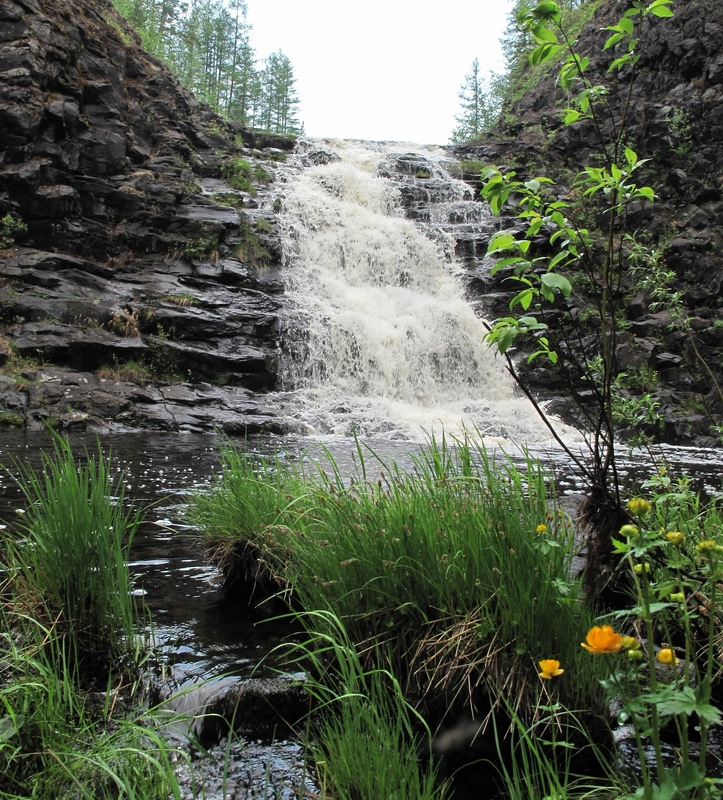 - This picture shows Churgim creek (and waterfall) again (picture by V. Bidyukova). - This picture shows Khushma river (picture by L. Pelekhan'). 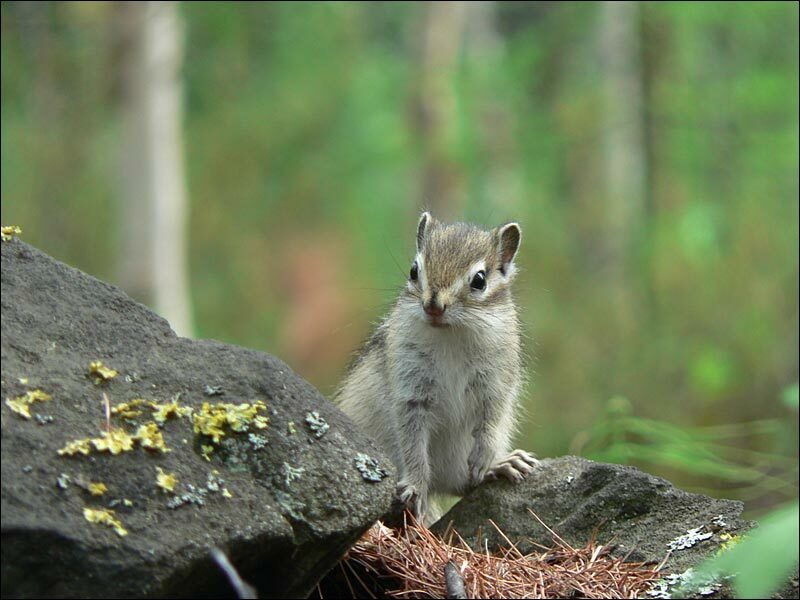 - This picture shows a local resident - a chipmunk (picture by V. Bidyukova). - This picture shows huts in the Pristan' area (about 7 km to the south from the epicenter). Picture by V. Bidyukova. 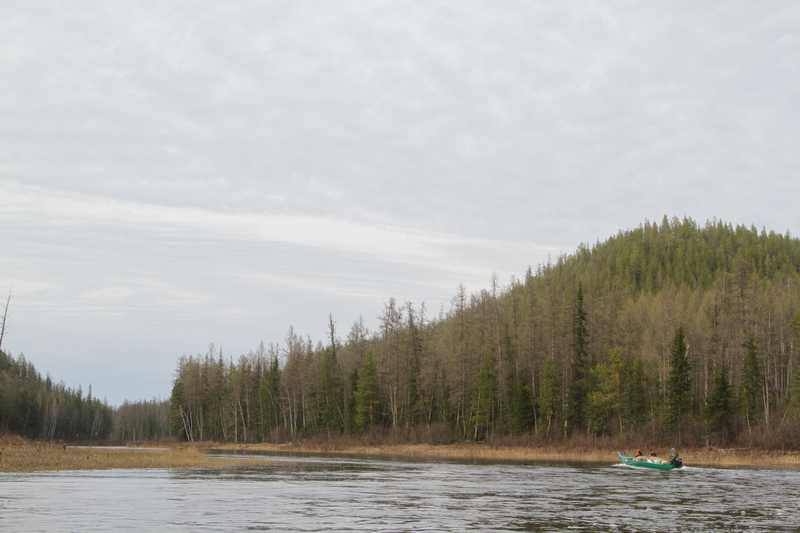 - This picture shows Vanavara seen from the Stony Tunguska river (picture by V. Bidyukova). - This picture shows Khushma river (picture by V. Bidyukova). 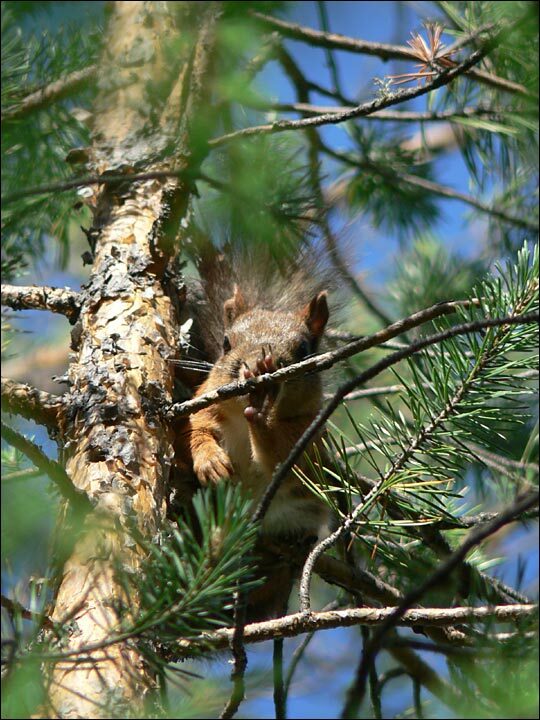 - This picture shows the local resident taking his meal (picture by V. Bidyukova). 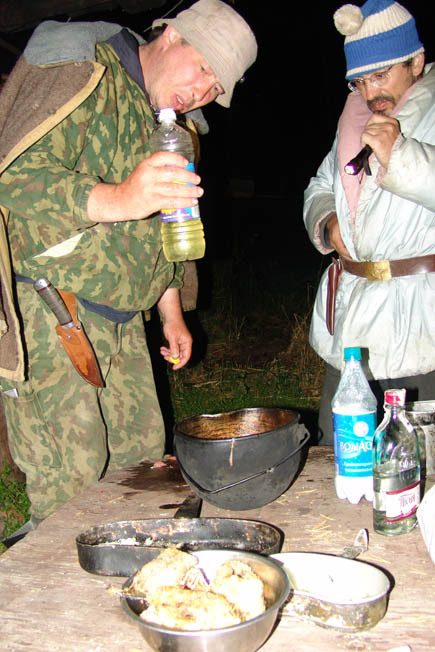 - This picture shows labaz for preserving food (as during Kulik's expeditions). Picture by V. Bidyukova. - This picture shows another kind of a local resident who could be interested in the labaz's lining. (picture by V. Bidyukova). - This picture shows another view of Khushma river (picture by V. Bidyukova). 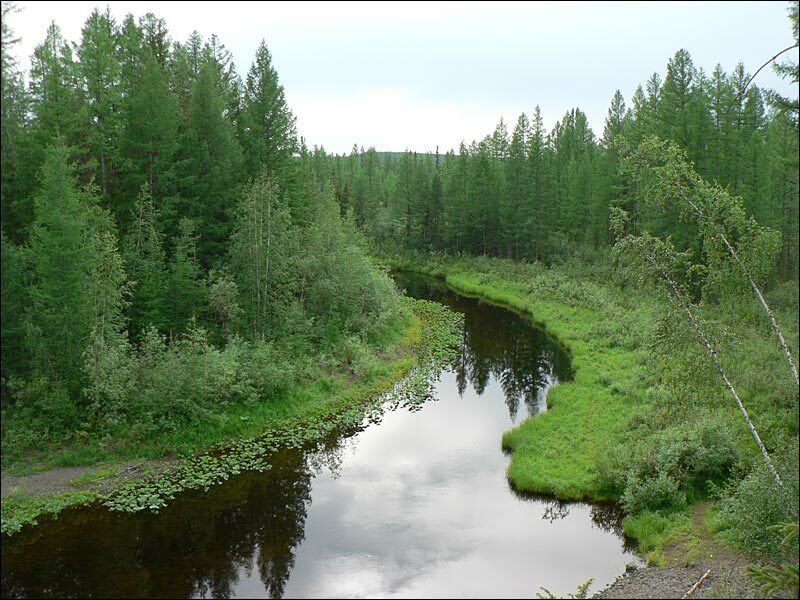 - This picture shows the Stony Tunguska river again (picture by L. Pelekhan'). 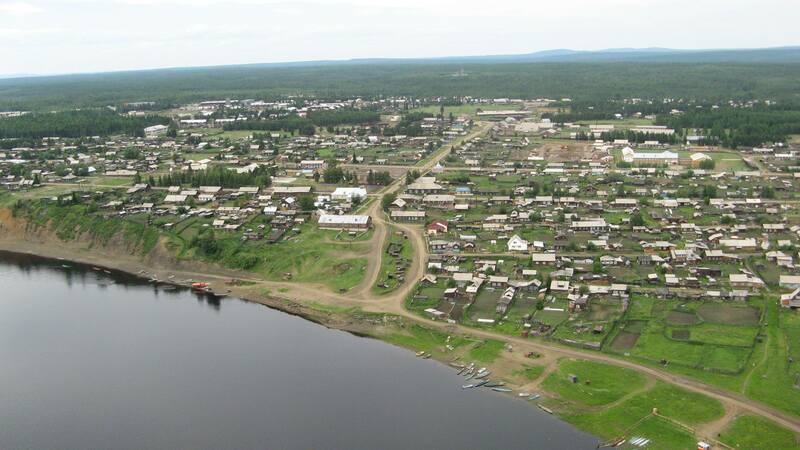 - This picture shows a view from a helicopter (picture by L. Pelekhan'). 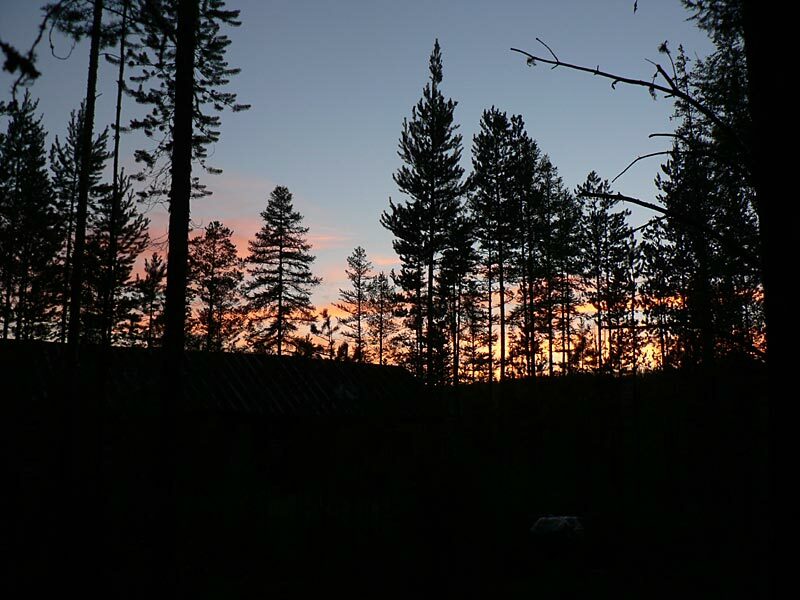 - This picture shows a sunset in the Tunguska epicenter area (picture by V. Bidyukova). 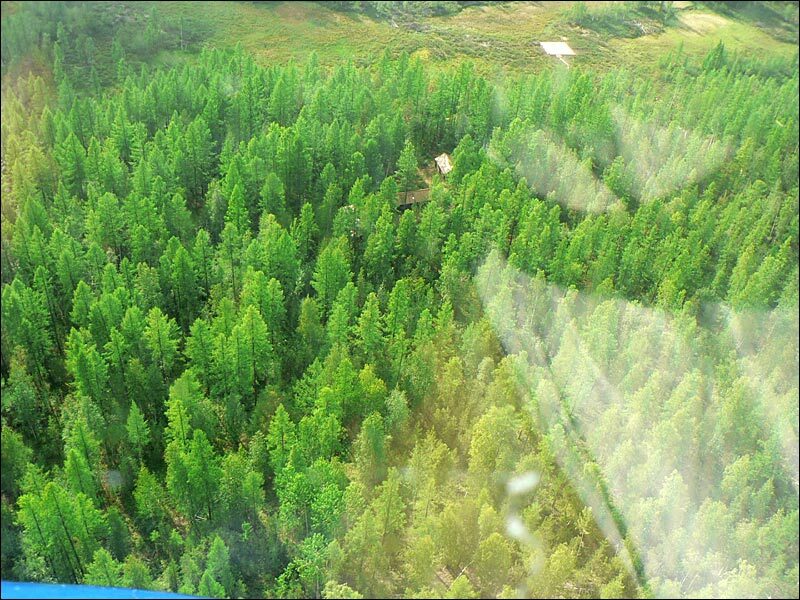 - This picture shows a view from a helicopter (in my impression it is near Pristan'). Picture by V. Bidyukova. 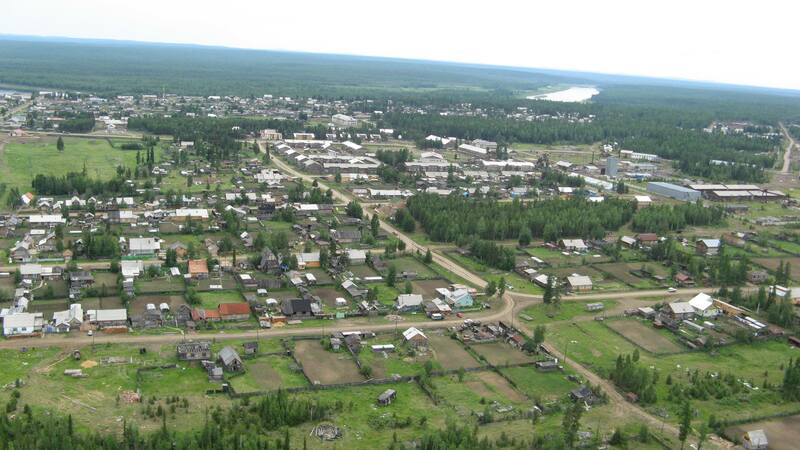 - This picture shows another view from a helicopter (in my impression it is Pristan'). Picture by V. Bidyukova. 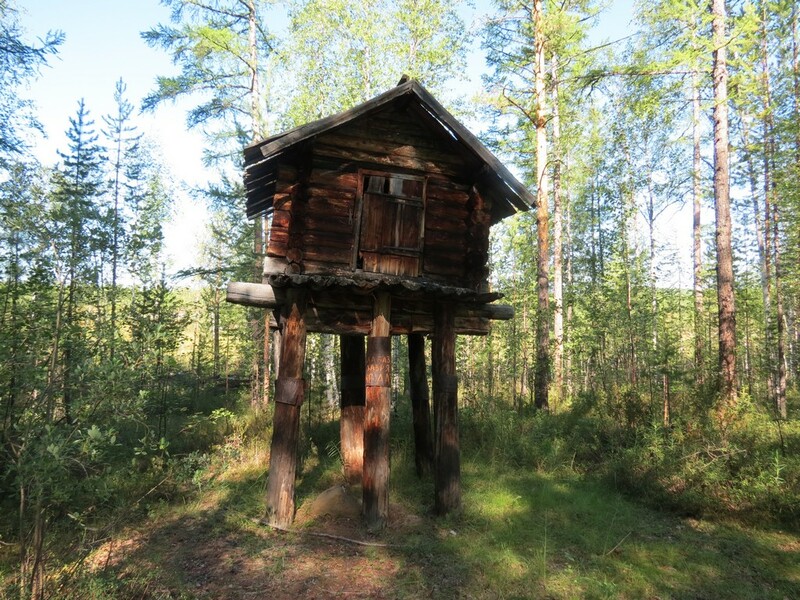 - This picture shows a new hut at Pristan' (picture by V. Bidyukova). 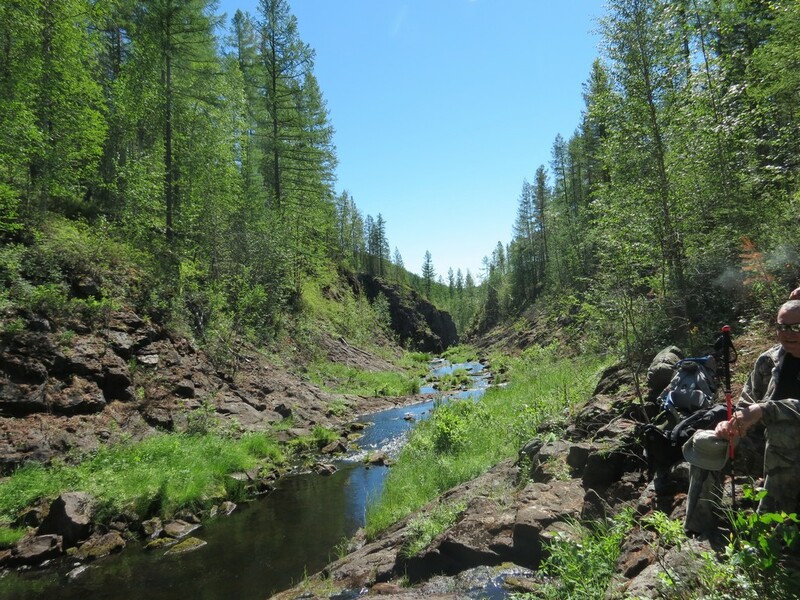 - This picture shows a meeting on a path through taiga (picture by V. Bidyukova). 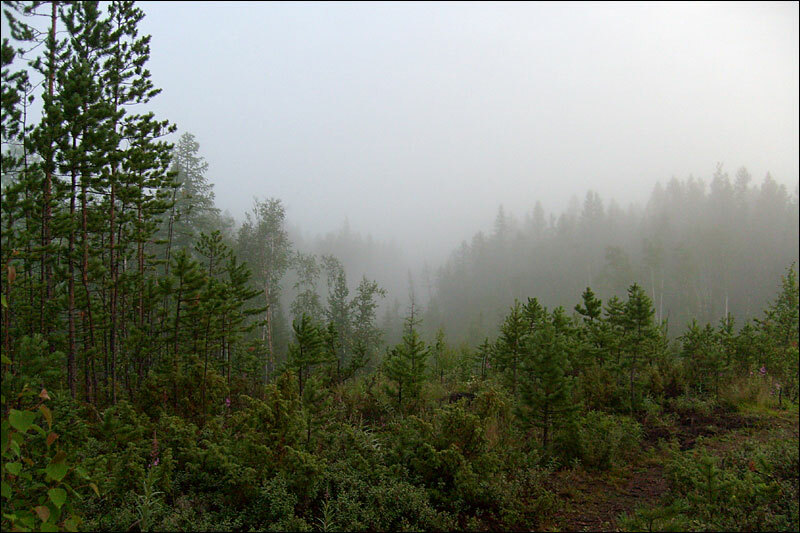 - Fog in taiga (picture by B. Bidyukov). 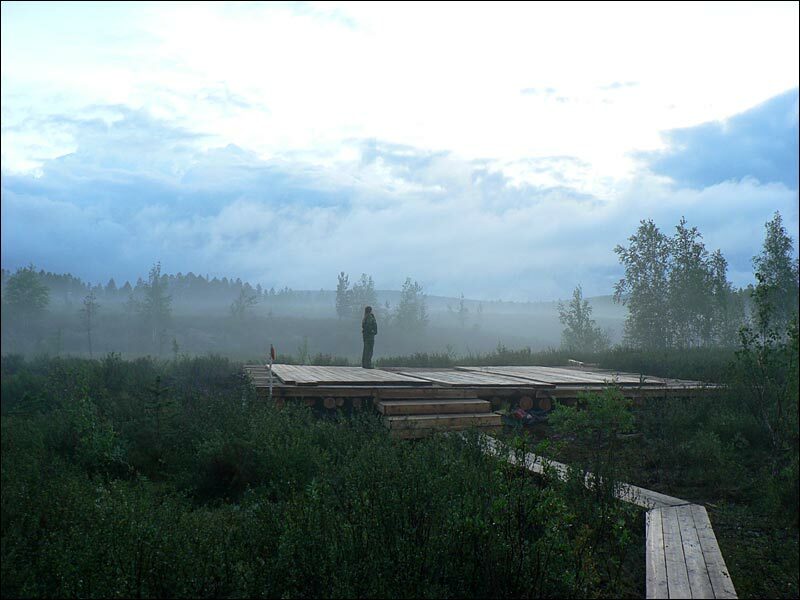 - Fog, a helicopter landing area, a taiga near the Tunguska epicenter (picture by V. Bidyukova). 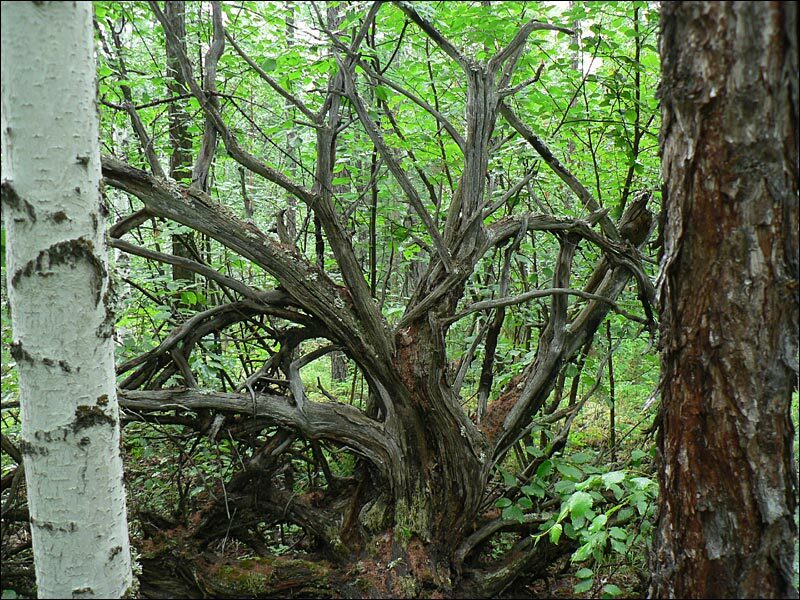 - Swampy area near the Tunguska epicenter (picture by V. Bidyukova). 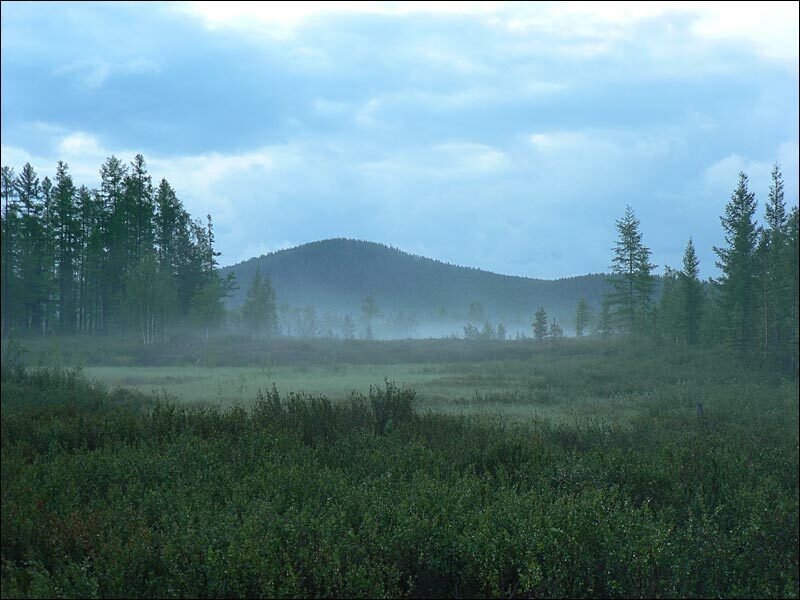 - Fog, and a mountain near the Tunguska epicenter (picture by V. Bidyukova). 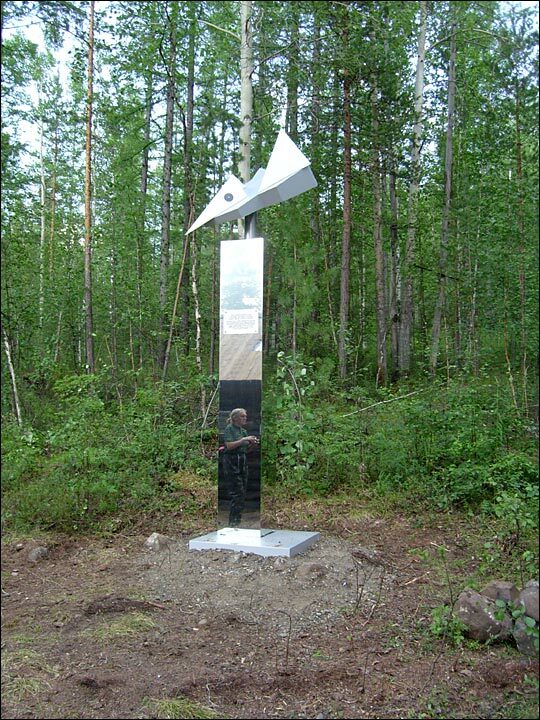 - A monument to the 'originator of the Tunguska event' near the Tunguska epicenter (picture by B. Bidyukov). (March 21,2017) I hope to regularly update with new pictures, while the previous ones were no later than of the year 2008. All the photoes below are given to me by Valentina Bykova (unless otherwise stated). Some photoes can be large! - Chamba river The Chamba river in the middle reaches. - The Southern swamp The Southern swamp - looking at the epicenter. - The Kulik's hut The Kulik's hut as looking nowadays. - The Churgim waterfall The Churgim waterfall - small but beautiful. - Looking from above The Vanavara settlement. - Looking from above Another photo of the Vanavara settlement. - Looking from above One more photo of the Vanavara settlement looking from above. - Looking from above A church in Vanavara. - Chamba enters Podkamennaya Tunguska The Chamba river mouth. 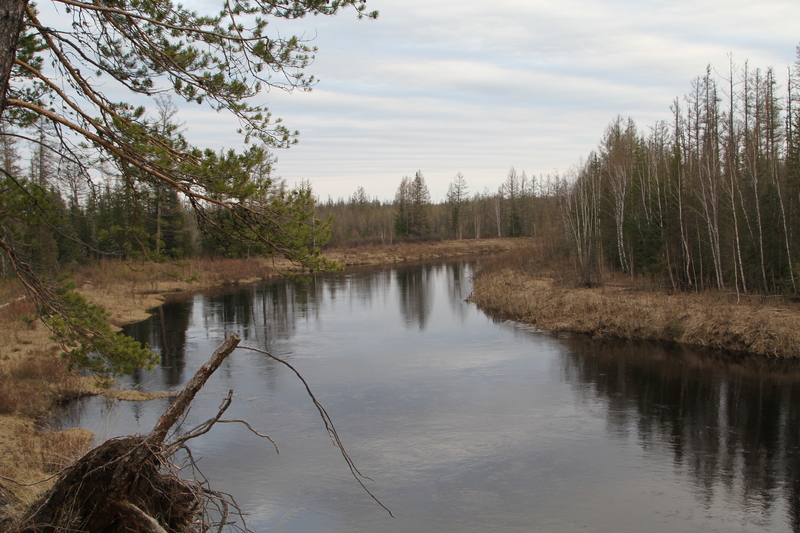 - Vanavara in the middle of this spring Podkamennaya Tunguska river. - Vanavara in the middle of this spring The Vanavara settlement. 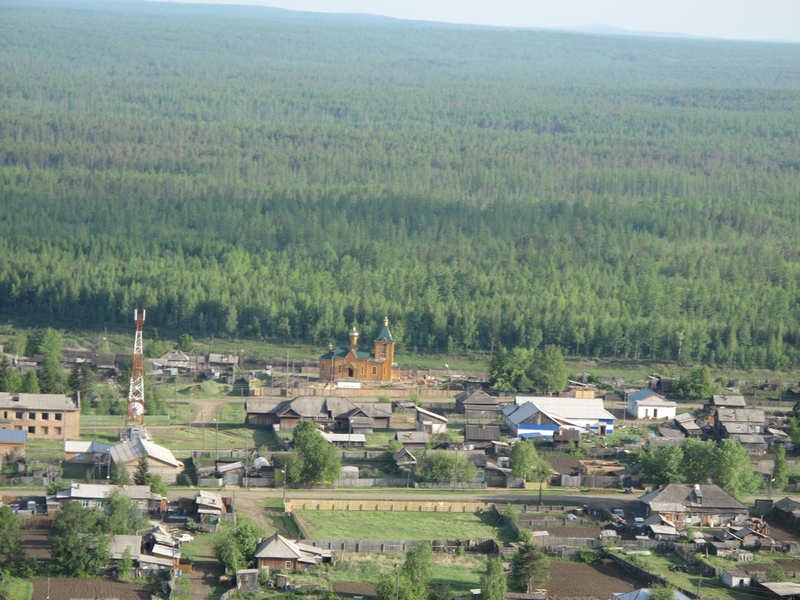 - Vanavara in June From a helicopter. 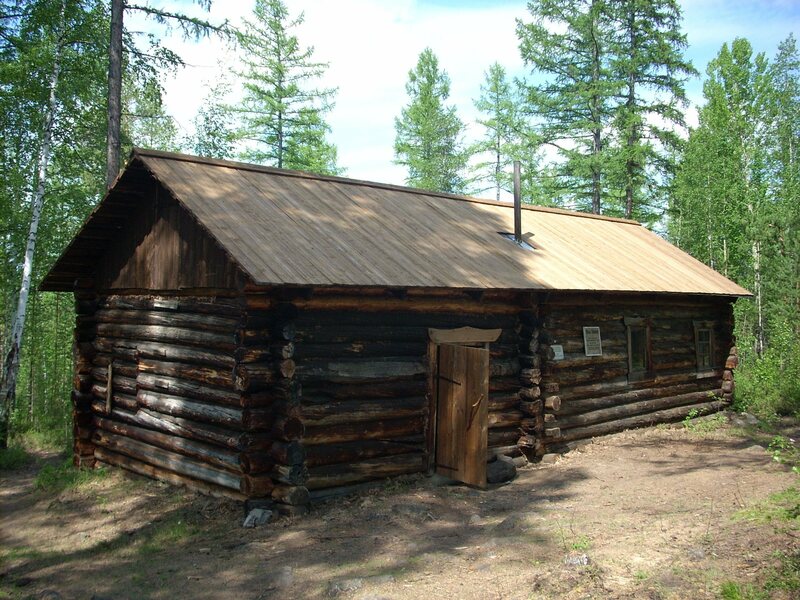 - A hut at the place 'Pristan' Some miles from the epicenter. 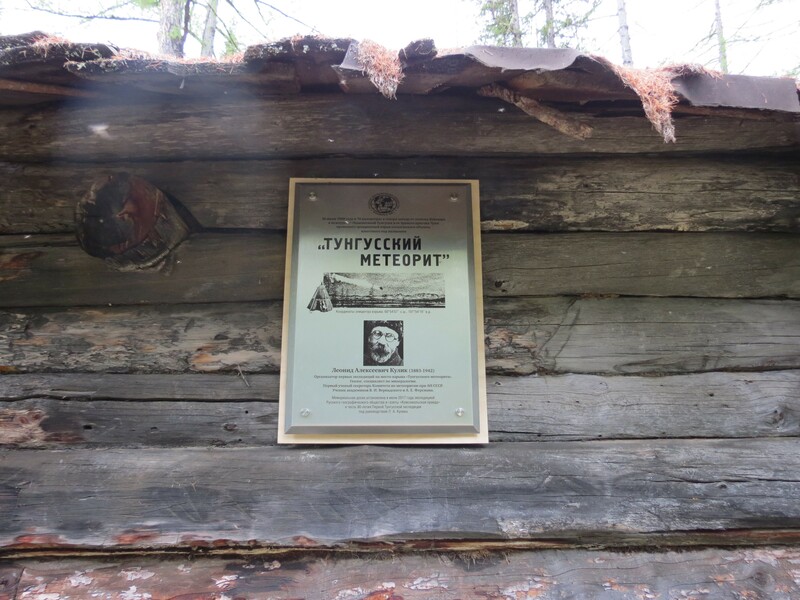 - Those who are interested in Tunguska recognised Leonid Kulik This plaque is placed on the 'Pristan' hut. - The waterfall Churgim A very popular place! - The river Khushma near 'Pristan' Several miles from the epicenter. - Mount Stoikovich Near the epicenter. 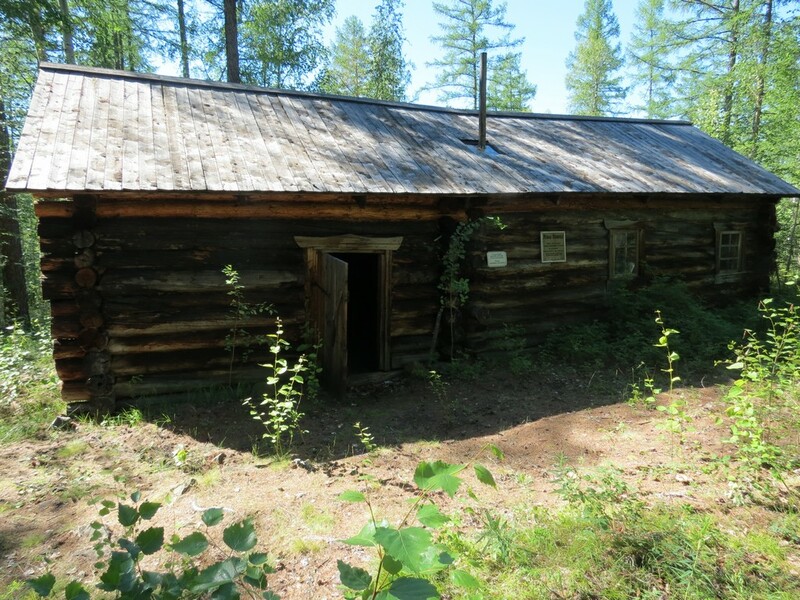 - The Kulik's hut As pictured in the second half of July 2017. 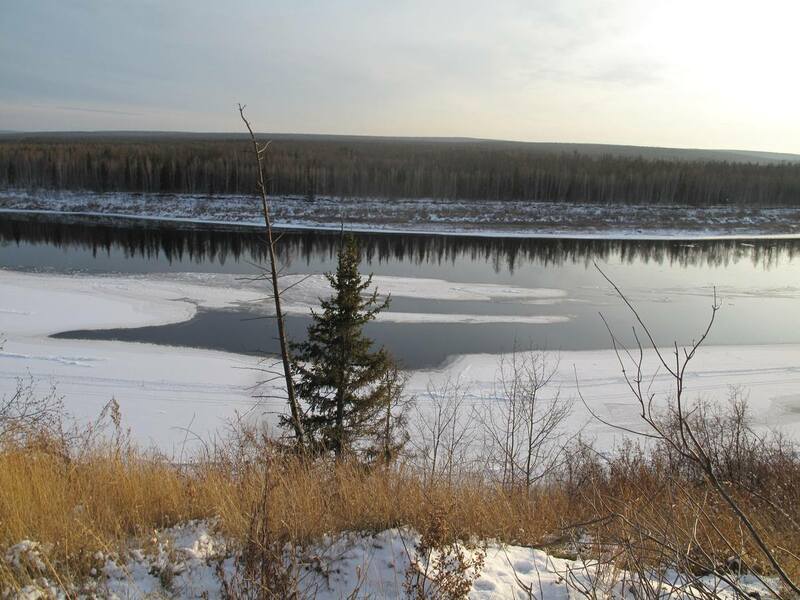 - The river Some ice is seen. 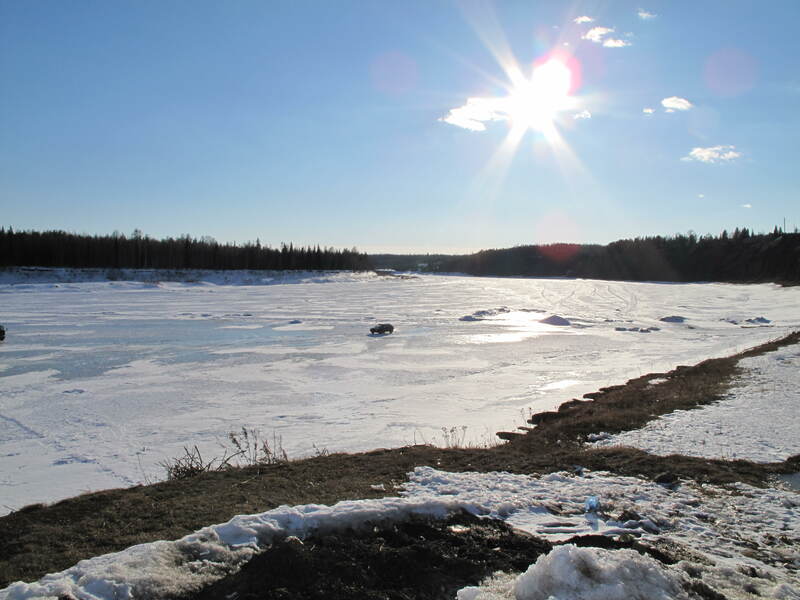 - The riverSome ice is seen. - Vanavara Snow cover appeared. 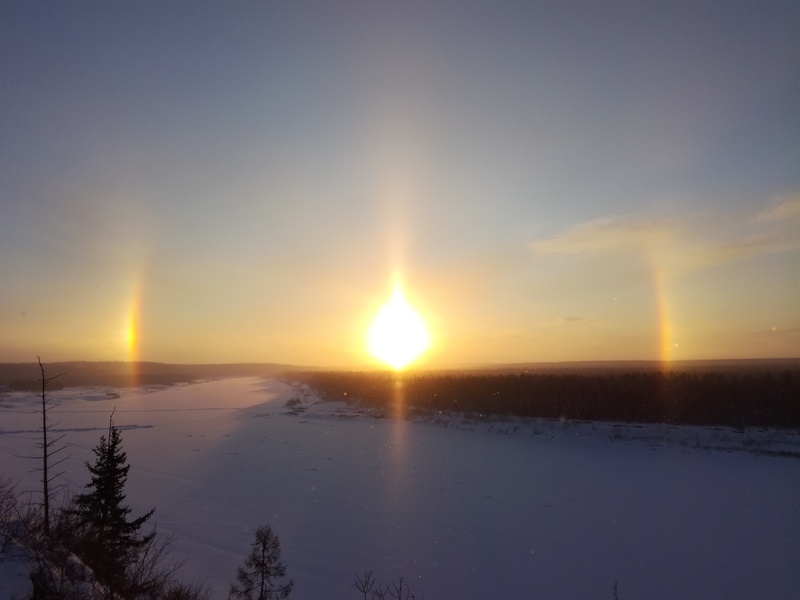 - A sunrise A sunrise pictured (by Evgenia Moroz) from Vanavara on Jan.29, 2018. 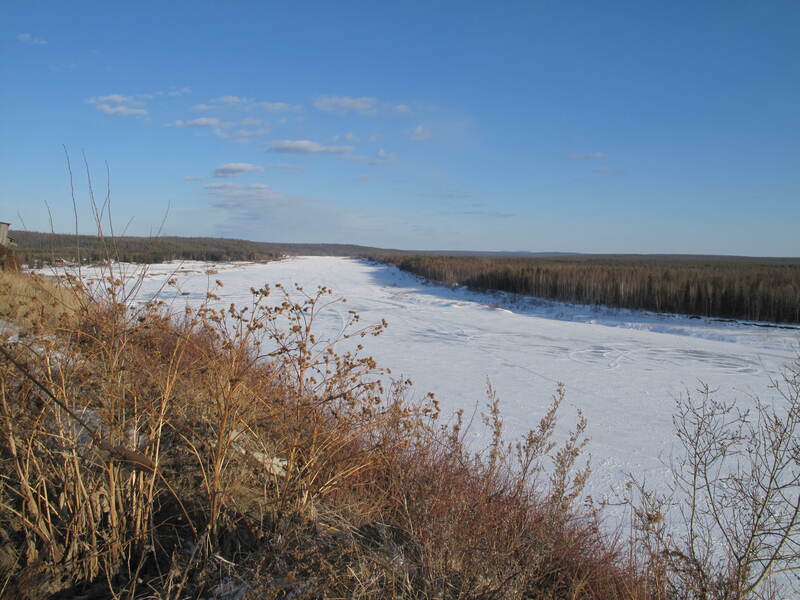 -A debacle Ice-cover is broken and is drifting on the Podkamennaya Tunguska river pictured on May 2, 2018 by Valentina Bykova. 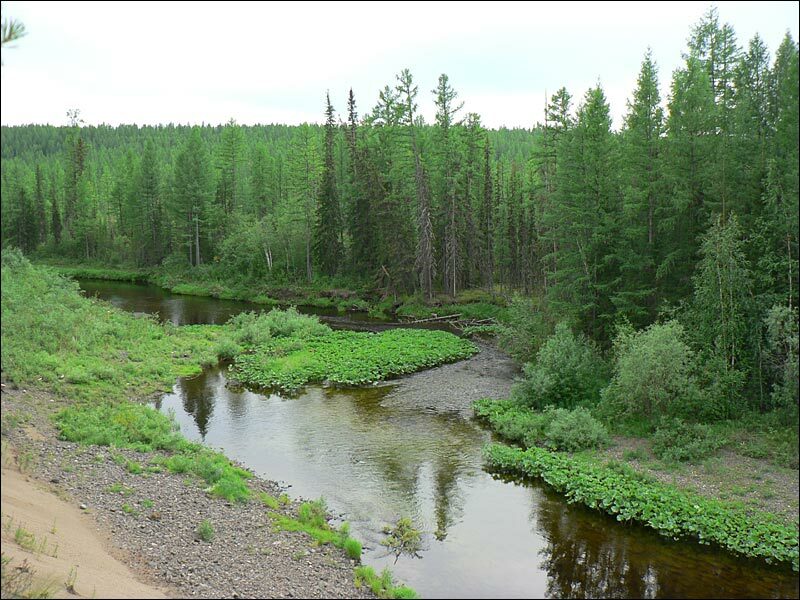 -The end of spring in Tunguska On May 25, 2018 there are first signs of the 'real' spring on the Podkamennaya Tunguska river near Vanavara. - A motorboat The motorboat was used for transportation of the workers. 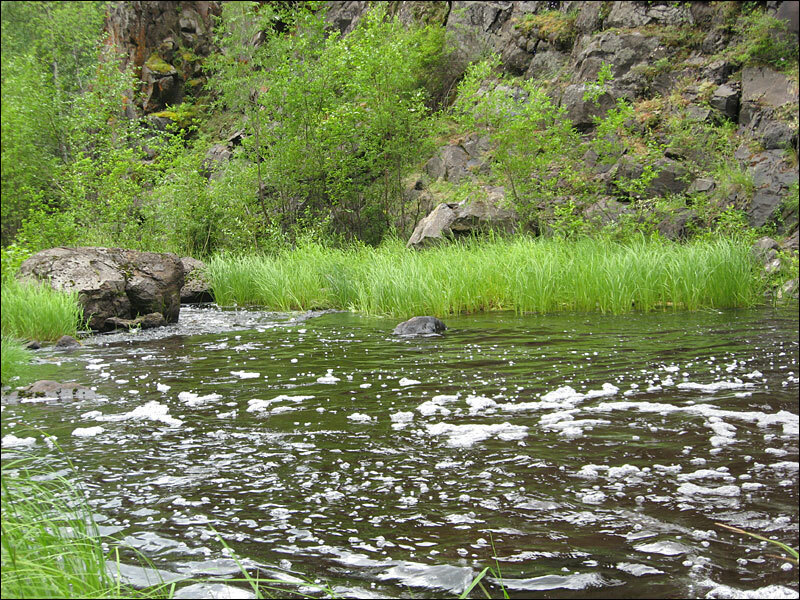 - A river The summer is still to come.